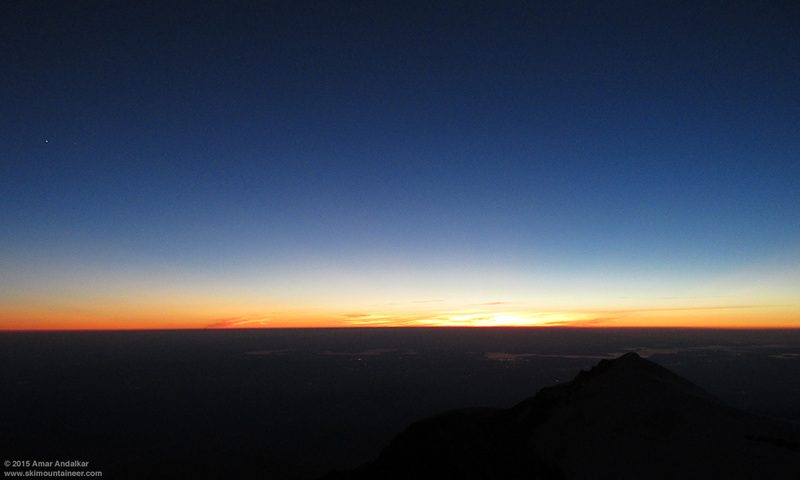 Summary: Enjoyed a spectacular 4th of July weekend atop the summit of Mount Rainier (14411 ft), camping in the summit crater for 2 nights on July 3rd and 4th, and watching the fireworks shows throughout the Puget Sound basin from the highest viewpoint in the entire region! Although I was the only one camped atop Rainier this weekend (well almost), it was great to see several of my friends up there too, summiting via the Emmons Glacier on the mornings of the 4th and 5th. 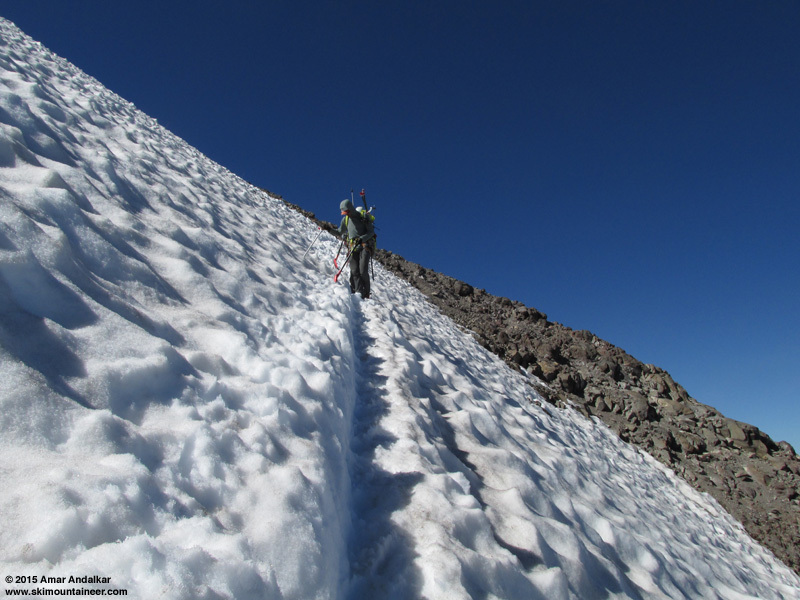 I climbed up on Friday July 3rd in under 11 hours from Paradise (5400 ft) to the summit via the standard DC route, which is in much too-interesting condition with 5 ladders bridging various crevasses. Very unusual for early July and more like late-August or September conditions in normal years, close to the edge of my comfort level for soloing. 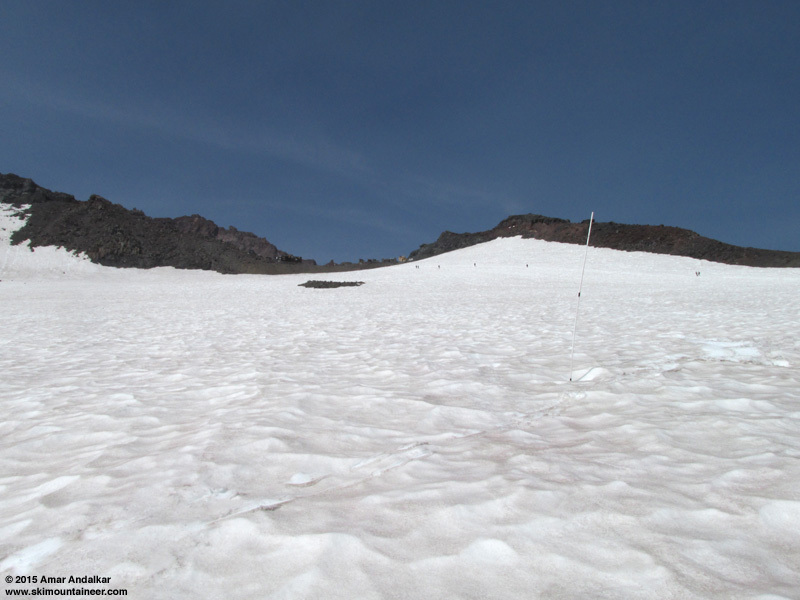 Even brought the skis up to Camp Muir (10100 ft), as the route above that is not in any condition for skiing, while the suncups on the Muir Snowfield are not nearly as bad as recent reports indicated. Had an unexpectedly enjoyable ski run of almost 3000 ft down to Pebble Creek on the way out mid-afternoon on July 5th, to cap off a memorable weekend exploring the upper reaches of the highest mountain in the Pacific Northwest. My 37th summit of Rainier and one of the most unique out of all those trips, well worth writing about at length! Decent turns in semi-smooth corn snow on July 5th. 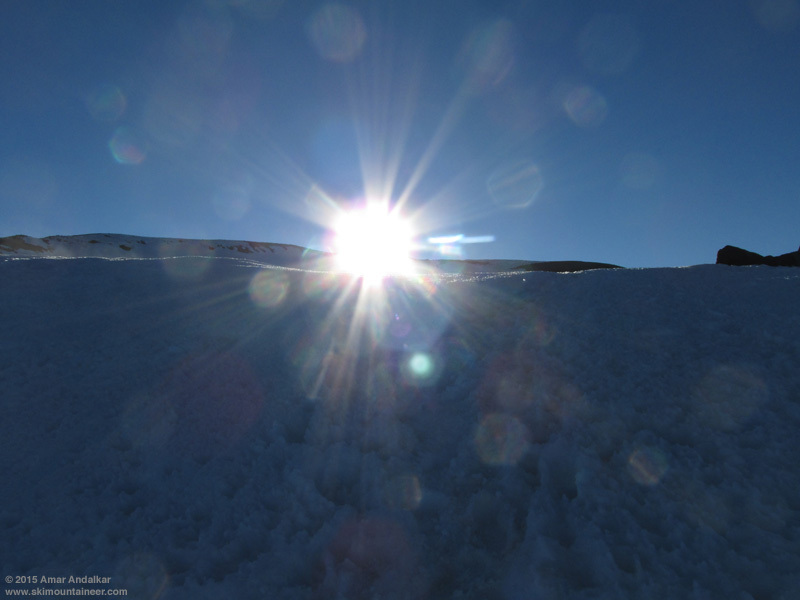 I took about 900 photos over the 3 days, including many large multishot panoramas -- so there are lots of photos below, with many unusual views from atypical locations around the summit and at uncommon times of day for Rainier! Details: I had long heard of people watching the 4th of July fireworks shows from Mount Rainier's summit in years past, and had wanted to try to do that for at least the past 15 years, in addition to just wanting to camp up in the summit crater at some point in nice weather for a few days. But it's very rare to get ideal weather conditions for comfortable camping atop Rainier's summit on the 4th of July, needing stable high pressure for several days with a freezing level over 14000 ft along with very light winds, not to mention an absence of clouds or marine layer fog at any elevation below in order to actually see the fireworks from the summit. This year finally had absolutely ideal weather conditions with freezing levels forecast to be in the 15000-16000 ft range and winds under 20 mph, so I decided to beat the ongoing Seattle heat wave (a record-tying 5 straight days over 90 �F from July 1-5) by hanging out at the coldest location in the Pacific Northwest, the summit of Mount Rainier. The summit region consists of a pair of overlapping volcanic craters, each about 1/3 of a mile in diameter, with the newer east crater a full circle overlying the older west crater which is more semicircular in form. All portions of the rims of both craters are well above 14000 ft, with the low point of the east crater at 14180 ft on the southeast side where the standard DC climbing route reaches the rim, and the low points of the west crater rim above 14320 ft. 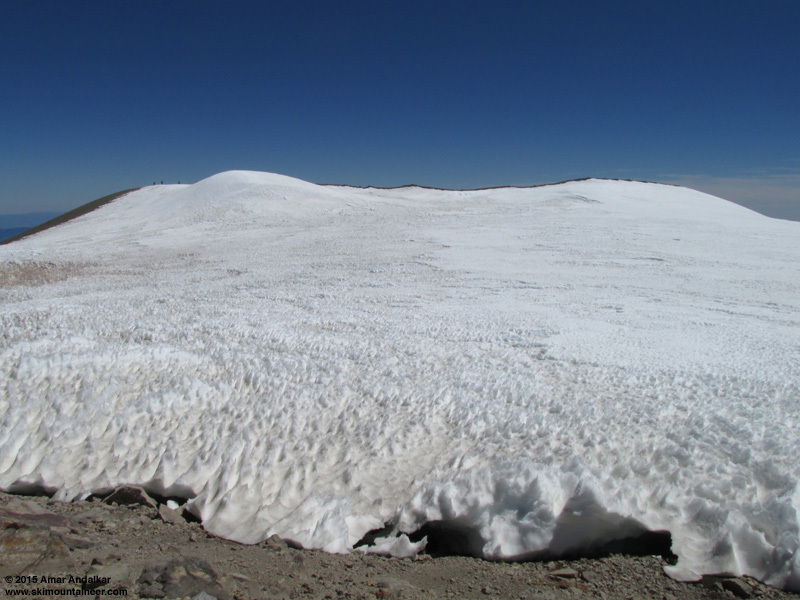 The true summit is a mound of permanent snow and glacial ice known as Columbia Crest, reaching 14411 ft on the northwest side of the rim between the two craters. Each crater is about 300 ft deep, but also filled with permanent snow and glacial ice to form a nearly level surface in the west crater and an eastward tilting surface in the east crater. 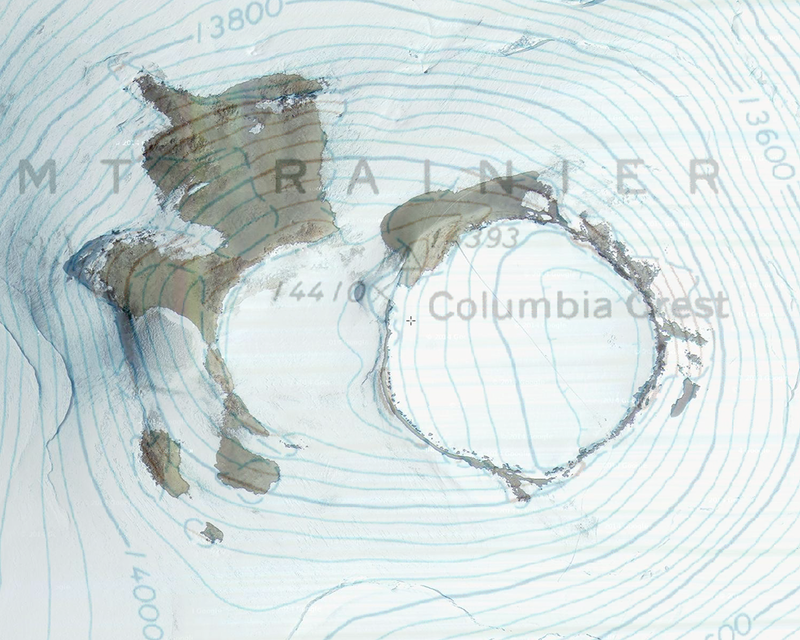 Both craters contain a stable network of steam caves under their glacial ice, carved out by geothermal heat, which have existed in nearly the same form since first seen in 1870. The caves are dozens of feet in diameter in spots, with the largest chambers over 100 ft wide, and a small lake is found under the west crater, at about 14100 ft elevation it is the highest lake in the United States. Recent explorations in 2014 have found another small lake under the east crater too. 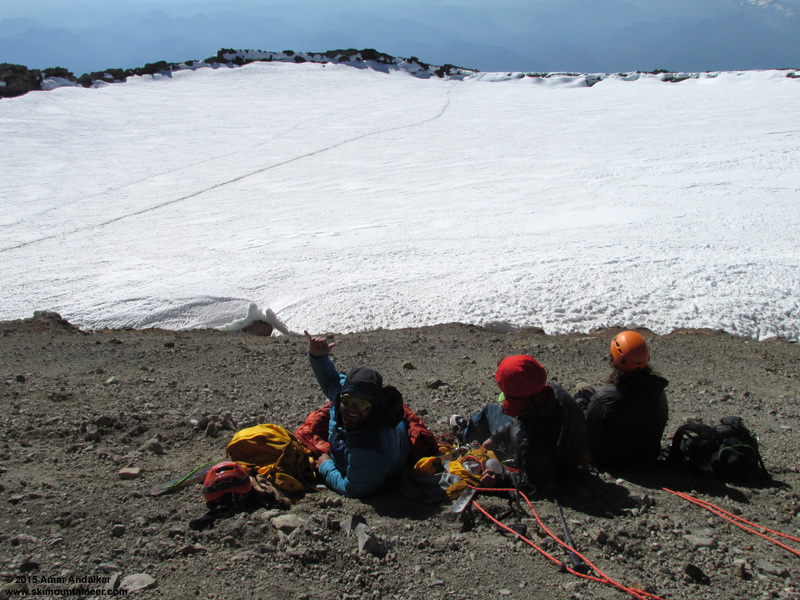 Ordinarily it would be best to acclimatize slowly to the 14000+ ft elevation, with air pressure and oxygen only 58% of sea level, by spending at least 1-2 nights at Camp Muir (10100 ft) or Ingraham Flats (11100 ft) on the way up. But since I didn't have any partners this time, I decided to push my limits and try doing the entire climb in a single day. Climbing to 14000+ ft from sea level in less than 12 hours and then camping overnight would be a recipe for severe altitude sickness in perhaps 99% of people, with debilitating AMS (acute mountain sickness) almost certain for most and life-threatening HACE or HAPE (high altitude cerebral / pulmonary edema) very likely for some. 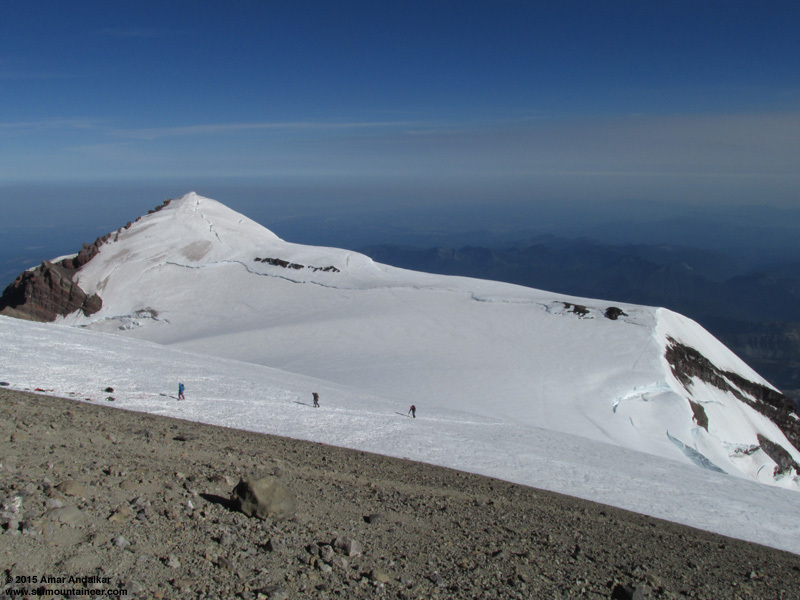 However, given my long history of 1-day summits on both Rainier and Shasta (14179 ft) with no altitude issues, along with 6 summit ski descents of those two 14ers in just the past 4 weeks, I figured it was worth a shot to try climbing it in a day with a heavy overnight pack, and I really wanted to see how I would fare under such severe altitude stress. 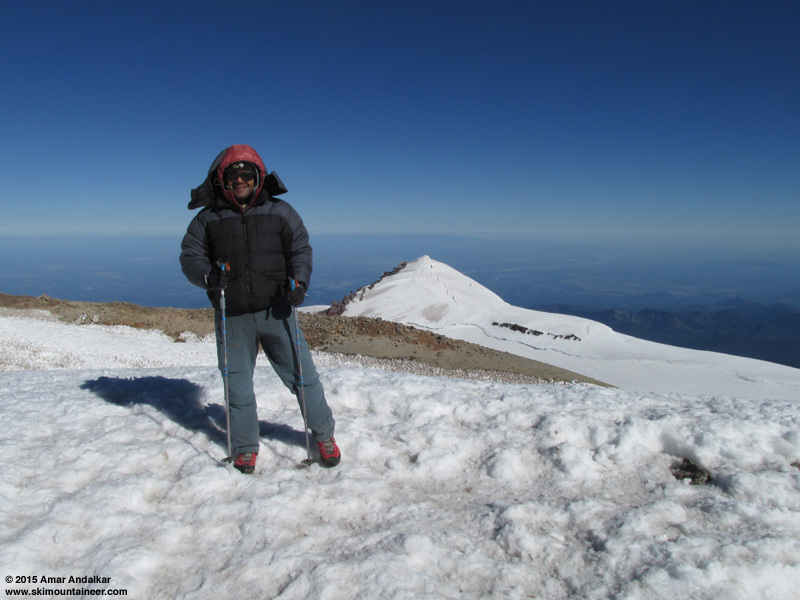 In addition, during the one previous night that I had ever spent on Rainier's summit, an unplanned emergency bivouac in a steam cave in the summit crater 7 years ago, I had experienced no altitude sickness despite a 1-day summit and the severe stress of being stuck overnight alone at the summit inside a sudden lenticular cloud (see TR: May 4-6, 2008, Mt Rainier, Fuhrer Thumb + Survival, the TAY thumbnail script remains broken, but the photos all work if you click them). So it seemed likely that it would be OK summiting in a day and sleeping overnight up there this time too. Started off on the wrong foot though by getting zero sleep on Thursday night, other than a late afternoon nap, I was unable to sleep at all overnight in the stifling heat and soon 4:30am had arrived, time to drive to Paradise. I arrived just before the Climbing Info Center was scheduled to open at 7am, but unfortunately the climbing ranger on duty was very late and did not open the doors until 7:30am, while over a dozen increasingly annoyed and frustrated climbers waited and waited and waited to register. In the end it was almost 9am before I was heading up from the lower overnight parking lot, hiking in mountaineering boots and carrying 65 lbs including skis and ski boots plus my 1996-vintage 1-person Walrus tent along with 3 days food and 4 days fuel. 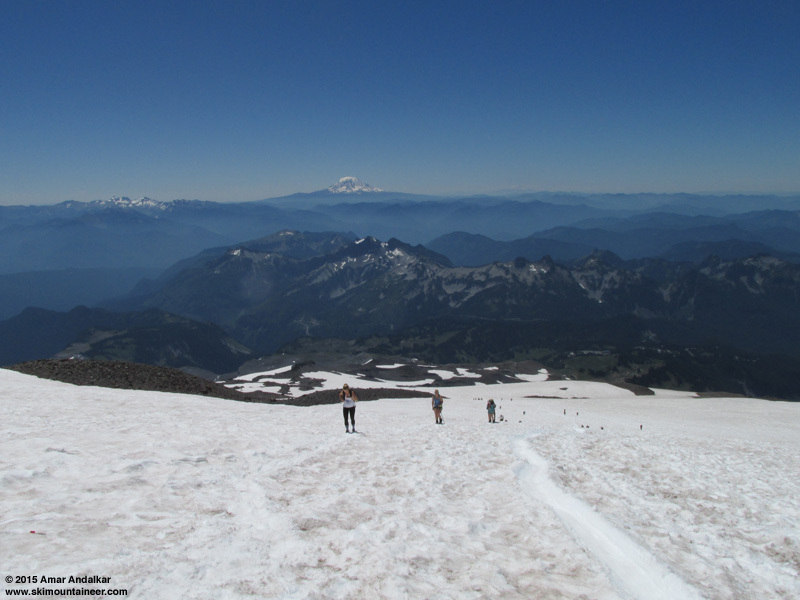 In a normal year, there would still be continuously skiable snow down to Paradise into early-mid July (the average July 1 snowdepth is 44"! ), but in this most anomalous of snow years, I knew I would be carrying the skis up to Pebble Creek at 7200 ft.
A lovely mid-August wildflower display along the Deadhorse Creek trail near Paradise, except it's on July 3rd! 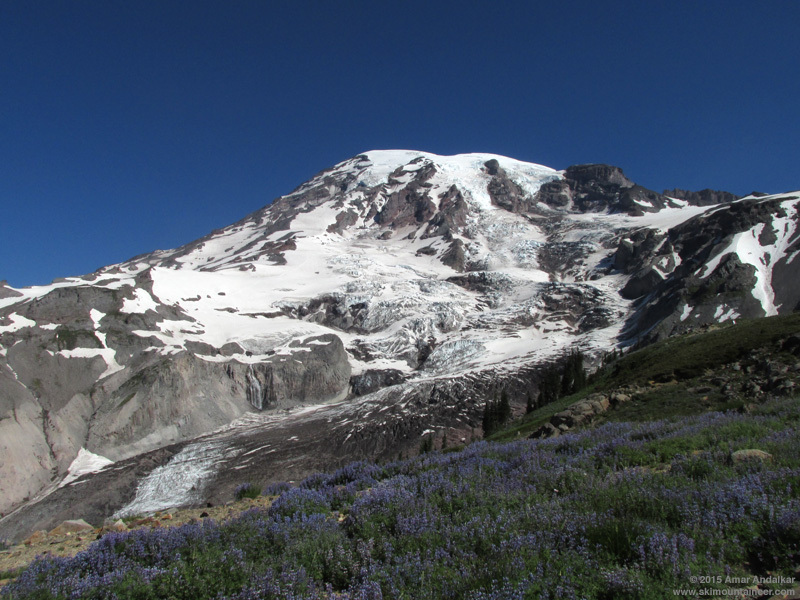 Rainier towering above a purple sea of lupine near Glacier Vista. Enjoyed a stunning profusion of wildflowers along the trail, and reached skiable snow at Pebble Creek as expected in under 90 minutes (large discontinuous patches extend lower down to about 6900 ft). I was very glad to trade 12 lbs off my back onto my feet by skinning up the rest of the way to Muir. 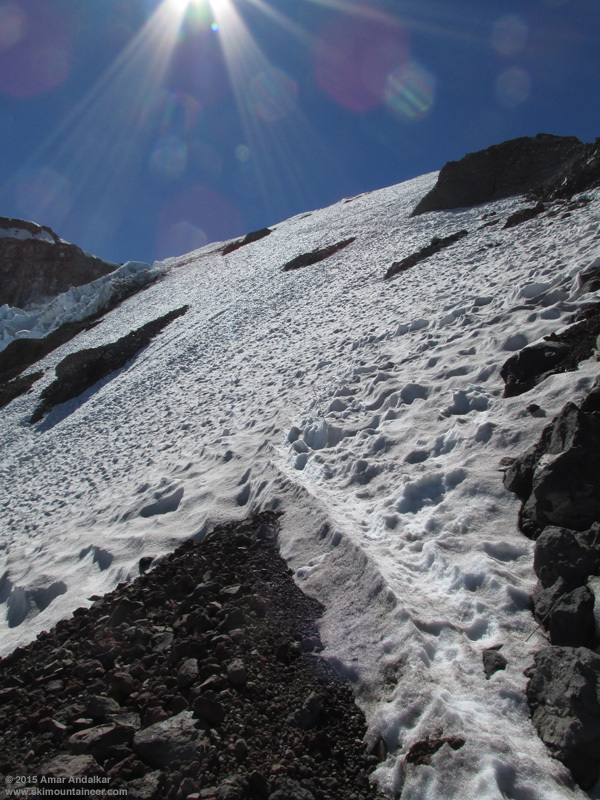 It had been 26 days since I had last skied near Paradise, a summit ski descent via the DC on June 7 (see trip report on FB, did not finish the TAY version of it yet), followed by the Emmons 3 days later and then a long road trip down to Shasta (another trip report on FB, with no TAY version yet). Although the snow was certainly not smooth like it was back then when it was continuously skiable from 6000 ft near Stevens-Van Trump memorial, it was much less suncupped than I expected based on recent reports. It looked like typical August conditions and was very easily skinnable in the warm morning sunshine. The park's new contract helicopter flying past Nisqually Cleaver near 13000 ft, it's an AS350 B3, one of my all-time favorite rotorcraft. See this recent post on the climbing ranger blog for more info. 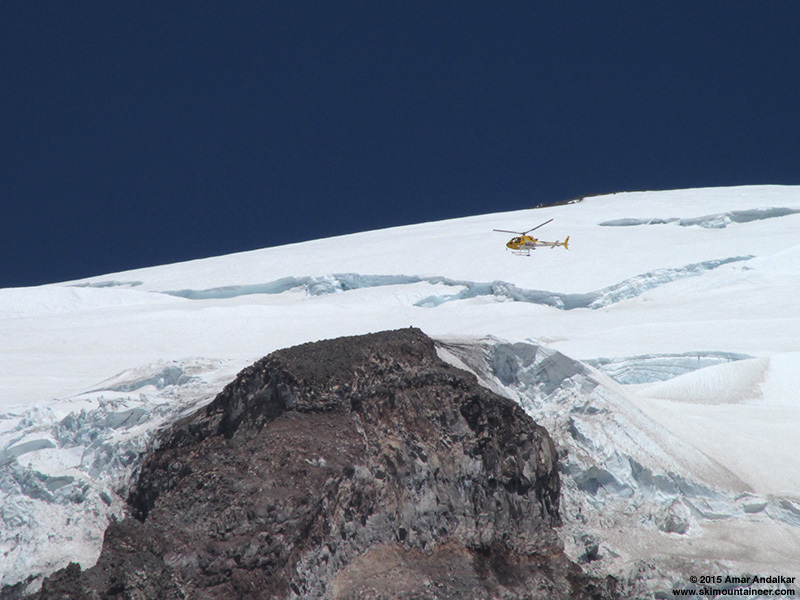 Shot with a 448mm zoom on a Canon SX160 IS point-and-shoot from about 8000 ft on Muir Snowfield, the current DC climbing route is faintly visible just below the helicopter above and right of Nisqually Cleaver. 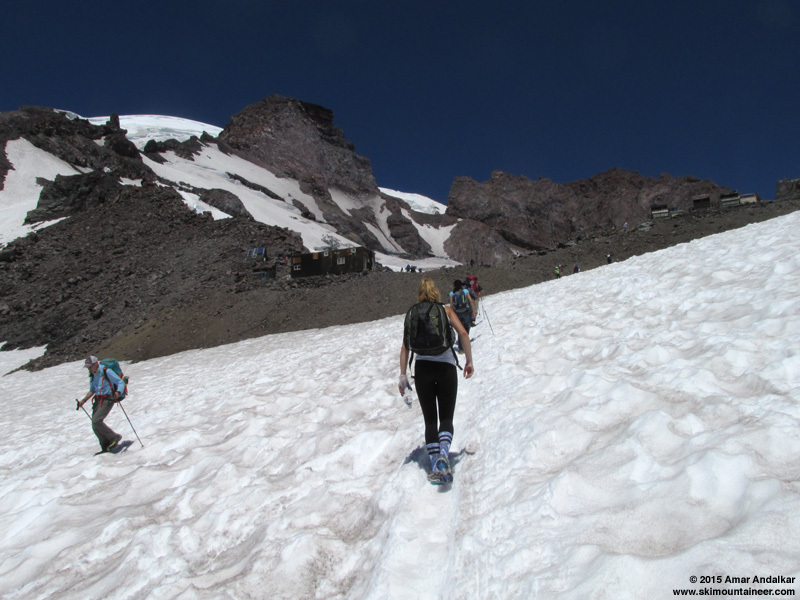 Kate from California, who had never been above 10000 ft before, matched my 1400 ft per hour skinning pace from Pebble Creek all the way to Camp Muir in running shoes, leaving her 3 companions far behind, and we had a nice intermittent conversation as we ascended the Snowfield. Above 8500 ft the snow got more deeply suncupped, and I followed portions of various glissade tracks for easier skinning, as had a couple of earlier skiers who had skinned up, and then above 9500 ft there was finally a decent bootpack trench which also accommodated skinning. 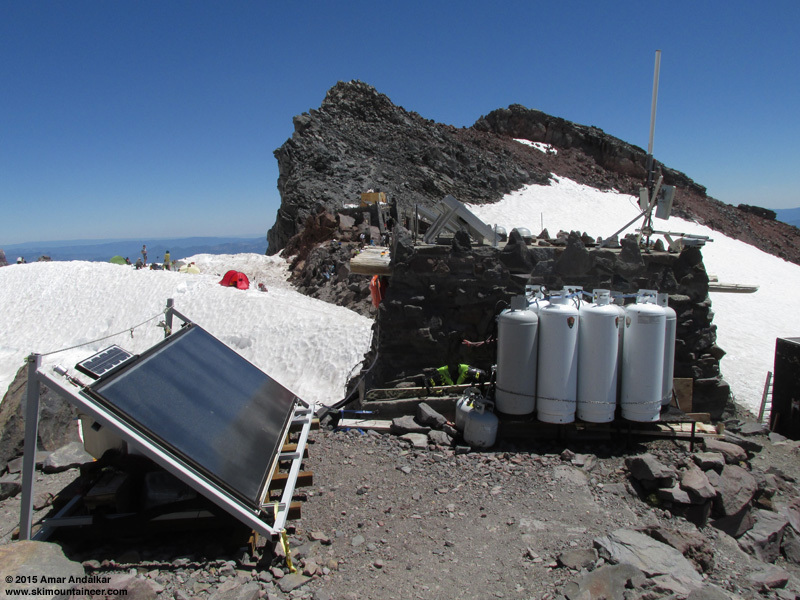 Arrived at Camp Muir just after 12:30pm, thankfully still avoiding most of the hot part of the day despite the lengthy morning delay. The delay really made no difference overall, since I had planned to wait at Muir until after 2pm anyway before beginning the rest of the climb, to allow the critical parts of the DC route above 12400 ft on the Ingraham Glacier to go into shade and begin re-firming in order to increase the safety margin. With the climbing ranger's permission, I stashed my skis and ski boots behind the ranger hut for safekeeping, since I would not be back for about 48 hours, and donned my climbing harness and helmet for the rest of the ascent, leaving at 2:10pm. 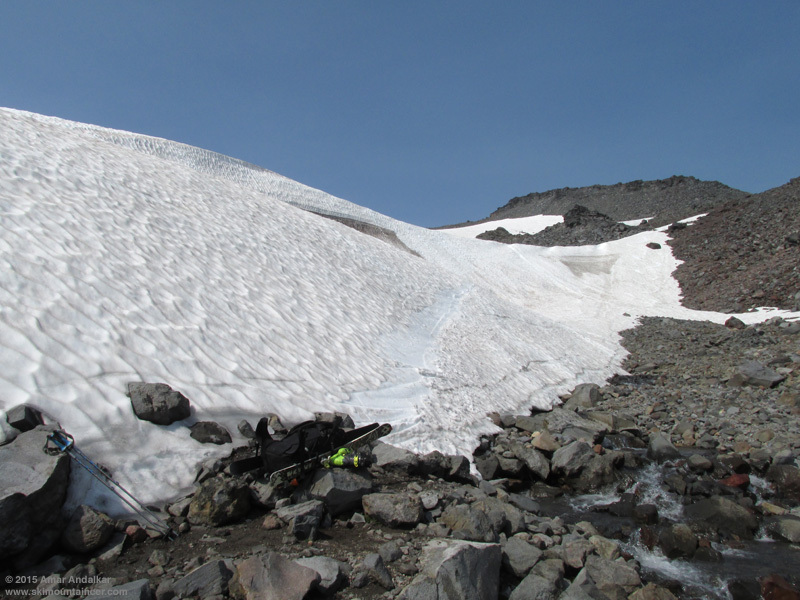 I kept the foot crampons off for the nicely softened snow across the Cowlitz Glacier and then up the scree trail to Cathedral Gap, but put them on once I reached the steep NE-facing sidehill of Dunn's Roll near 10900 ft. I would keep them on the rest of the way to the summit crater, including the 300 vertical feet of bare rocky trail on the DC, it was way faster and easier than taking them off for that. A new creek has recently formed at about 10850 ft carving into very dirty ice along the edge of Ingraham Glacier, it included a small waterfall a few days earlier according to the climbing ranger blog, sadly that part was dry today. 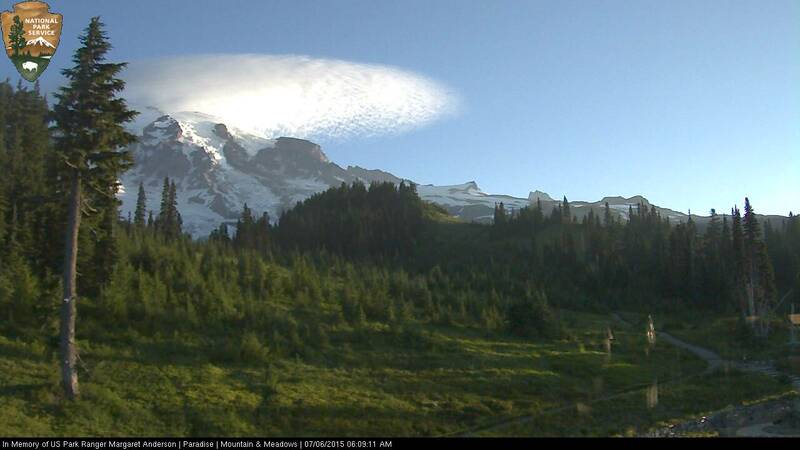 11138 ft Little Tahoma rises beyond. One of the most amazing things about the Ingraham Glacier is the awe-inspiring set of crevasses and seracs just below Ingraham Flats (11100 ft), easily 200-300 ft deep/high in spots, far greater than most normal crevasses in temperate-latitude glaciers which generally pinch off below 100-150 ft. As can be seen in the walls of these crevasses compared to the nearby tents, even in such a terrible snowpack year the thickness of the 2014-15 snow accumulation layer is about 40-50 ft at this location, which implies total snowfall this season of about 150-200 ft to produce that much consolidated snowpack at 50% density. That huge snowpack accumulation is a combination of direct snowfall and also tremendous wind-loading through 11250 ft Cadaver Gap and over the edge of the summit dome above 12660 ft Gibraltar Rock, and it produces both the stable nearly-uncrevassed expanse of the Flats and the huge extra-deep crevasses just below as the glacier flows over a sharp roll. 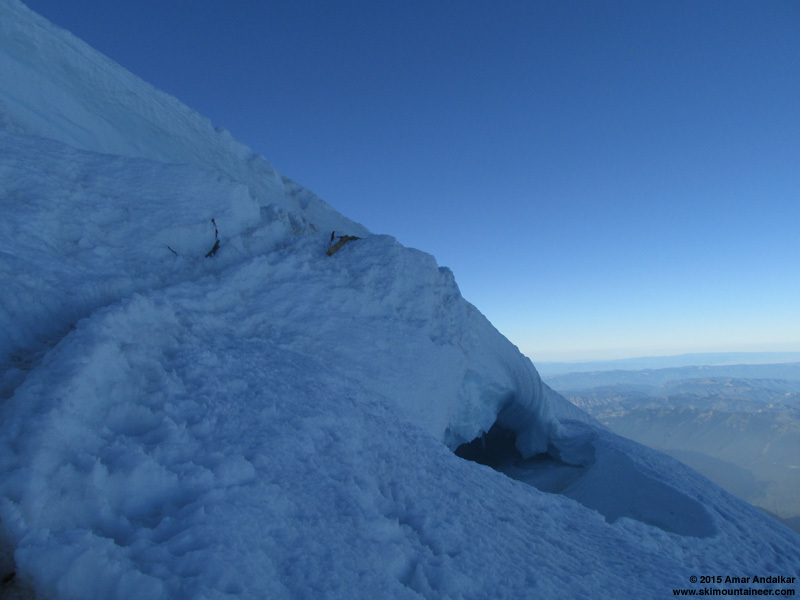 Similarly extra-deep crevasses are found just below the traverse over to the DC at 11400 ft too. I took a nice break and chatted a bit with the Alpine Ascents guided group camped at the Flats, and then continued up the route. The first crux is a pair of horizontal ladders at 11400 ft at the top of the rightward traverse below the Ingraham Icefall, these would be trivially easy if roped up, but are thought-provoking when solo. Although a stumble on a flat easy ladder is unlikely, it could happen to anyone, and falling off either ladder unroped would mean near-certain death here as the cracks were easily well over 100 ft deep. I was too sketched to really look down into either crevasse at this time (see the photo later from July 5th looking down into it). As I reached the bare rocky trail on Disappointment Cleaver just before 4pm, I noticed that a large forest fire had suddenly appeared on the western flank of Mount Adams, 50 miles to the SSE. The plume quickly grew to huge size over the next 15 minutes, rising to the level of Mount Adams' 12276 ft summit, and I would have a good view of it all the way up to the crater rim. 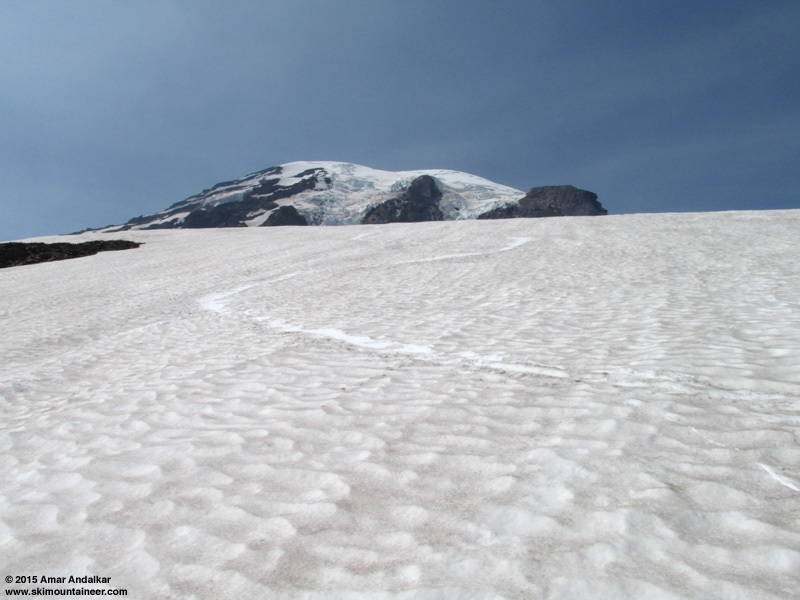 Upon returning to Seattle, I would find out it had been named the Horseshoe Fire and was located at about 5300 ft, and it had resulted in the closure of most of the�western portion of the Mount Adams Wilderness by July 4th, including a 13-mile segment of the PCT. 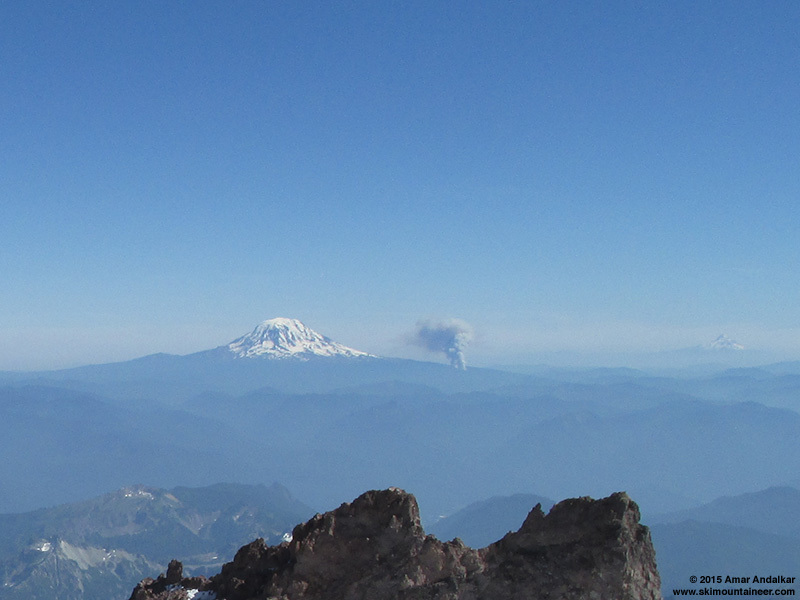 Only 15 minutes later, the plume has grown very quickly, reaching the level of Mount Adams' 12276 ft summit, with Mount Hood in the distance at right. Quite surprisingly, even though the DC route has changed significantly for the worse over the last 4 weeks since I had skied it, one thing that hadn't changed at all is where the continuous snow extended down to. The route still went onto snow at 11700 ft, the same spot I had skied to from the summit on June 7! So there was only about 300 vertical feet of bare ground to climb with its nasty loose rock, not bad at all, done with that in about 20 minutes. Glad to be back onto the snow at 11700 ft.
A few minutes later I was surprised to see a pair of RMI guides descending the route, recutting the switchbacks with shovels and nicely re-kicking-in the bootpack. They had just finished resetting the ladders higher on the route, a very welcome and unexpected gift. 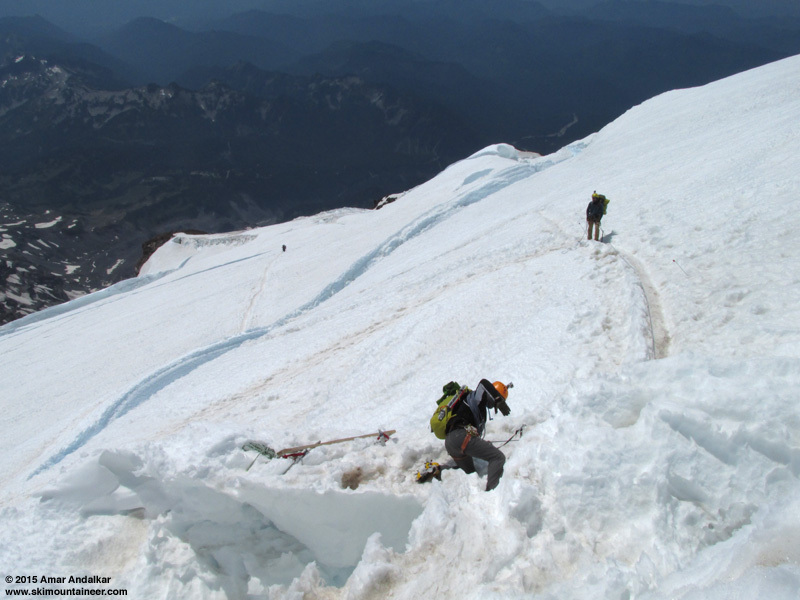 Their work meant an assurance to me that the route was quite safe to climb solo at this time. I chatted with them briefly and they mentioned that there was a solo climber still up above, so I knew I wasn't yet all alone up there. The route from here up to about 12800 ft is in almost exactly the same spot as it was 4 weeks earlier. One new development is another flat ladder around 12400 ft along the leftward traverse just above the top of Disappointment Cleaver. This ladder felt way less scary than the ones at 11400 ft, it was very short even though the crack it spanned was quite deep. And then the real crux: the rising leftward climb to reach the edge of Nisqually Glacier above Camp Comfort near 12800 ft, including the ladder at 12700 ft which had been the only ladder on the route 4 weeks earlier, and which I had been able to barely ski down past with a quick sketchy turn across a snow bridge just below it. The real hazard here is not even the crevasse or the ladder, but the towering seracs looming above the leftward traverse and climb, like shark's teeth jutting into the sky, each ready to tumble down across the route with 100% certainty at some unknown future time, perhaps minutes from now right as I'm crossing, perhaps in 2 days as I'm descending, perhaps in weeks or months. No way to know, it's a pure gamble with certain death as the outcome should a serac fall across the route as you cross, so you might as well tilt the odds in your favor before playing the game. 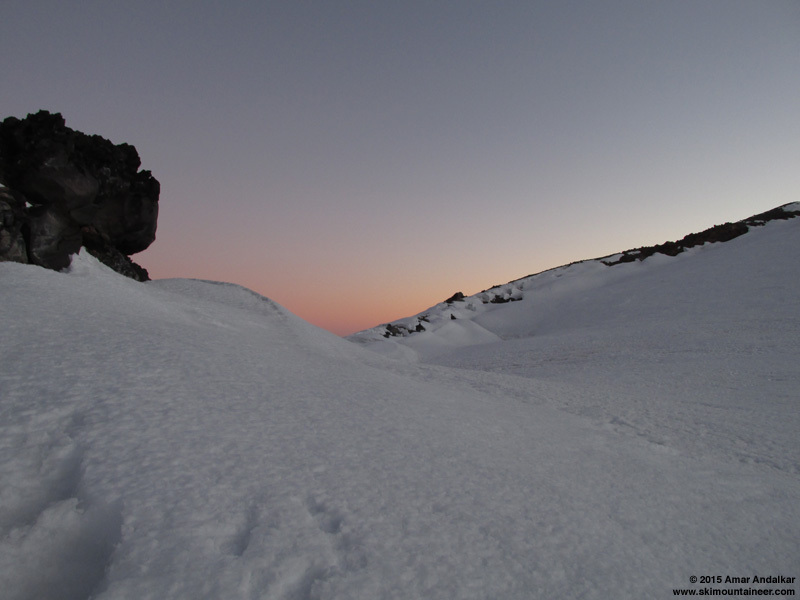 I was very glad to see that after 5pm now, this portion of the route had gone into shadow just as I had planned, and the snow had already refrozen due to radiational cooling in all the shadowed areas after only a short time out of direct sun. 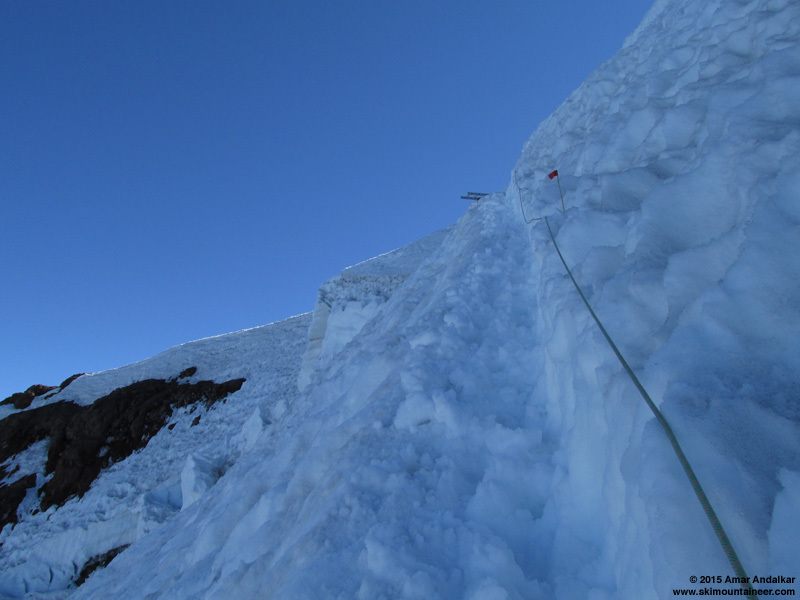 The orientation and position of the ladder at 12700 ft had changed significantly from 4 weeks earlier, rotating clockwise by about 60 degrees, now almost perpendicular to the bootpack, and with its tail end jutting out into space. I was glad to have a fixed line in place for this part, as it was on a very steep sidehill with severe crevasse exposure below, and made sure to clip into it with a runner, just in case. It's always good to bring a harness and at least some glacier gear even when soloing on this route. It was a relief to be done with that, and to return to the warm sunshine at the ridgeline above Camp Comfort after 20 minutes in the cold shadows. Glad to be back in the sunshine at 12800 ft. Gibraltar Rock (12660 ft) at left. The fire on Mount Adams has grown even larger now. Above the ladder it had been smooth sailing 4 weeks earlier with only a couple minor crevasse issues, but this time I knew that I was not home free yet. There was one more ladder yet to come, along with a couple of fixed handlines ascending short bulges of hard glacial ice on the Nisqually Glacier near 13000 ft. The soloist that the RMI guides had mentioned was descending just above that. We chatted briefly, and he mentioned that the route higher up was really sketchy and hard to follow. He also seemed worried about descending the crux of the route below without real crampons, as he said he was wearing Microspikes, but I could see that they were actually some other kind which looked far inferior to even Microspikes, mostly made of black plastic with small metal nubs and without metal chains (maybe Nanospikes? maybe some other brand). I was shocked by his lack of proper equipment: no real crampons, no ice axe, no harness (I was using 2 Whippet self-arrest poles as always, and carried a real ice axe too just in case it was needed). Even more shocked when he stopped about 20 ft below me and asked if I saw his "Microspikes" near me, as the right one had just fallen off! Really!?! I could see the black plasticky object lying in the bootpack at a switchback between us, just wow. The other soloist near 13000 ft, with Gibraltar Rock below. Yup, that right foot has no crampon on it, as it had just fallen off a few seconds earlier! The foolishness on display here was just mind-boggling, although perhaps some of it may have been due to inexperience too. I fully realize that soloing this route even with the proper gear I had brought is quite unsafe, and some may choose to criticize me too. But with his setup, it was just foolhardy and very stupid to be soloing this route in the current conditions and at that time of day. I don't say that to be mean or hypercritical, instead it's important that anyone reading this report realize just how inadequate and unsafe his gear choices were, and not repeat those errors should they choose to solo climb in such terrain. I was genuinely worried about him making it down the now-refrozen route without falling to his death, and it was obvious from his words and body language that he harbored those same fears himself. I couldn't watch him anymore as he backtracked uphill to retrieve his crampon, and turned away instead to focus on the rest of my own climb. A few switchbacks later, I caught a final glimpse of him, continuing down towards the crux and whatever outcome fate would bring him. 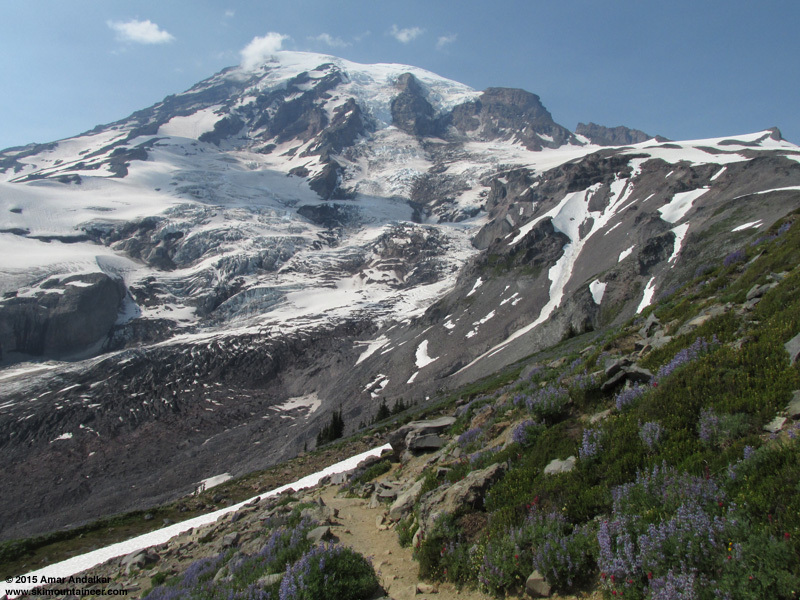 The route then begins a long westward traverse across the Nisqually Glacier, all the way over to Nisqually Cleaver. This traverse was unchanged since 4 weeks prior, but had a new twist at its very end: the 5th and final ladder near 13200 ft, resting at a slight angle almost directly on the snow, with no drop beneath it at all. 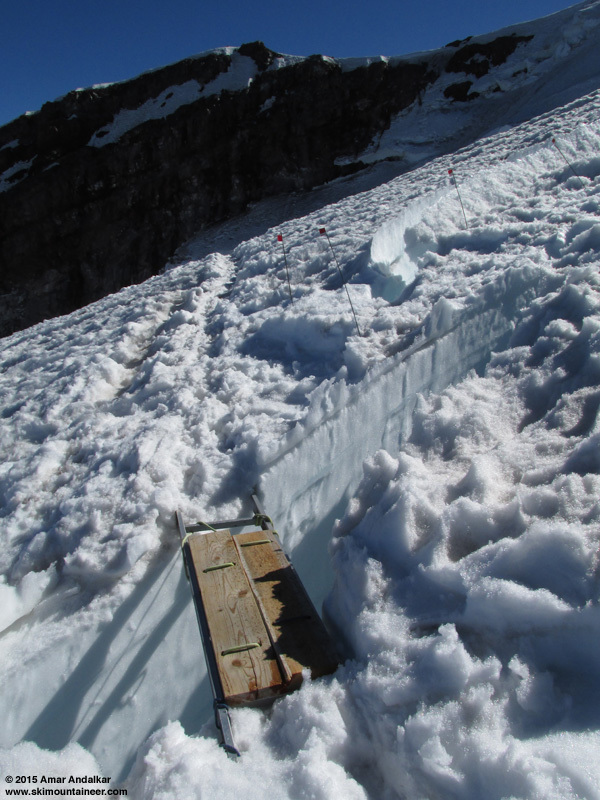 Except all of the snow beneath the ladder was a block bridging a large deep crevasse, so the ladder was there just in case, for whenever the block decided to eventually collapse into the crevasse beneath it. Above that, the route switchbacks numerous times as it had in June, but many sections had been recently rerouted, with the nice deep bootpack "closed" with crossed wands, while newer fainter bootpacks angled off to avoid the newly opening cracks. Definitely had to pay attention, and make sure to be following the correct (newest/safest) bootpack at all times, especially as the sun was now low enough as 7pm neared to put the whole route in shadow. The final crux was way up at 13900 ft, a sketchy crossing over the bergschrund with no fixed line or ladder in place, but anchors installed and various other supplies lying nearby, perhaps for an upcoming installation. Then just a couple more switchbacks left to reach the rim, but my pace had slowed dramatically, to only about 800 ft per hour, as the exhaustion of a big day with a heavy pack at high elevation with no sleep the night before was really hitting me. Nothing I could do about it but keep robotically pressure-breathing and rest-stepping upward for a few tens of minutes more. And then finally the crater rim, with the sun shining over from above the true summit of Columbia Crest, such a relief to be done! 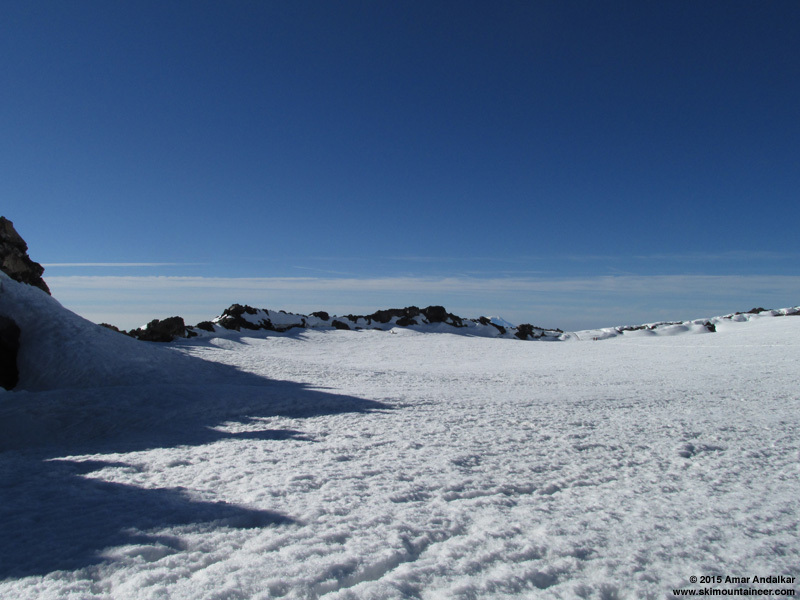 Glad to be back in the sunshine at 14180 ft, the crater rim at long last. It was 7:45pm, about 5.5 hours after leaving Muir, not a bad pace at all with a roughly 45 lb overnight pack, but I was totally beat and done. I would not be visting the true summit this evening, setting up camp would be all that I had energy left for. I was thankful to have about 20 minutes of direct sunshine left in the easternmost part of the crater until just after 8pm, even though sunset would not be until well after 9pm. I wanted to site my tent to maximize the remaining minutes of sunlight and also be far enough away from the bootpack to not be disturbed by the numerous climbing parties sure to arrive starting before dawn. I also wanted to be as close to the crater rim as possible for wind protection, but knew that I had to stay a safe distance back from all the steam cave entrances lining the inside of the rim, where the thin snow could easily result in a collapse and really bad outcome. (Even guides have accidentally fallen through these thin spots into the caves below, resulting in major injury and helicopter evacuation in one memorable May 2009 incident, just as we arrived at the rim on a 1-day Ingraham Direct ascent to Fuhrer Thumb ski descent.) The snow was quickly refreezing as the sun disappeared behind the summit, but I carved out a reasonably smooth platform in a reasonably good location and set up the tent by 8:30pm. I was exhausted and felt really tired, about as worked as I've ever been upon arriving atop Rainier, but a lot of that was certainly due to no sleep the night before. I was fully functional in setting up camp, melting water, and cooking dinner, and had few real symptoms of AMS (acute mountain sickness): no headache, no nausea. Without headache, it turns out that AMS can not be the diagnosis at all (see e.g. http://www.high-altitude-medicine.com/AMS-LakeLouise.html and http://www.high-altitude-medicine.com/AMS-worksheet.html, and especially read the exceptional book about altitude issues, Going Higher: Oxygen, Man, and Mountains). I did experience lightheadedness a few times when I stood up suddenly from setting up the tent to do something else, but that would fade immediately and after a few times, I realized I needed to just not stand up so quickly anymore. A lovely glow just after sunset at 9:20pm, looking back towards where the climbing route hits the rim. And I would soon have a truly miserable night without proper sleep. I woke up dozens of times and probably never slept more than a few minutes at a time until after 4am when I finally got some solid sustained sleep, surprising given how tired I was and how much I needed to sleep. In addition, I had horrible hallucinating dreams numerous times during the brief early bits of sleep, which would be a side symptom of HACE (high altitude cerebral edema), except I had none of the other standard symptoms of it at all. And I was totally freezing for the first couple of hours in my ultralight 32� sleeping bag (an excellent Western Mountaineering Summerlite), despite wearing full clothing plus a synthetic puffy and a very warm Feathered Friends Volant down jacket, along with a hot water bottle for my feet. The air temperature was just above 32 �F overnight, but somehow I could not stay warm, until I eventually closed the drawcord around my face to a tiny opening and let my exhaled breath warm the inside of the sleeping bag for the rest of the night, which fixed the problem. Definitely one of my worst nights of sleep ever, maybe the single worst. I think that even a single night at Muir on the way up would have prevented those sleep issues. Overall, my test of pushing my limits under severe altitude stress had been largely successful, since I made it to the top in a day and slept overnight without any real altitude sickness. Nevertheless, it was a huge difference sleeping suddenly at 14000 ft (with 58% of sea level pressure and oxygen) versus 10000 ft (70% of sea level) which almost always has been totally fine. There is definitely some type of physiological threshold that the human body crosses between those two elevation levels which makes a very significant difference in the ability to travel quickly from sea level and then sleep overnight comfortably. July 4th: I was planning to sleep in late the first morning, and despite hearing climbing parties arriving at the rim from about 3:30am onward, I stayed in bed until after 7am, when the warm sunshine begin to spill over the crater rim and fill the tent. I felt much better despite not sleeping much, although definitely still tired, and headed out for a wander around the crater rim and up to the true summit. 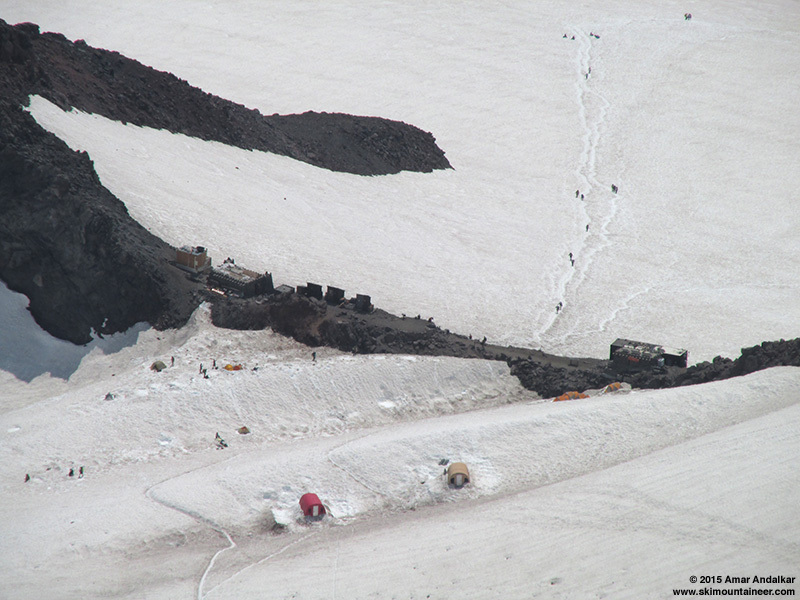 I knew that some friends would be arriving soon up the Emmons Glacier too. 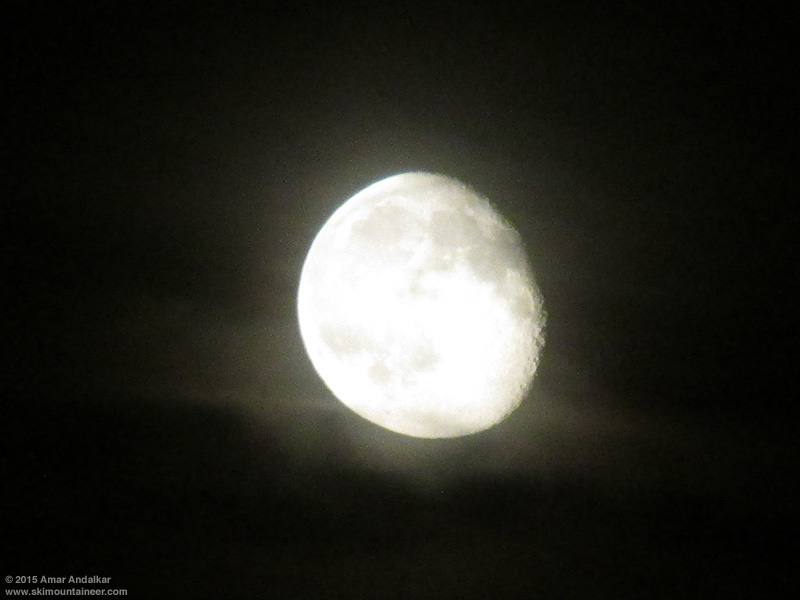 The nearly full moon descending past the crater rim at 7:40am. I stopped by the summit register at 14350 ft Register Rock located on a hydrothermally-warmed snow-free section of the crater rim, and totally protected from the current wind, almost calm there and quite warm in the direct sunshine. My friends arrived shortly around 8:30am, and we headed up to the true summit for some photos, and hijinks in their case. 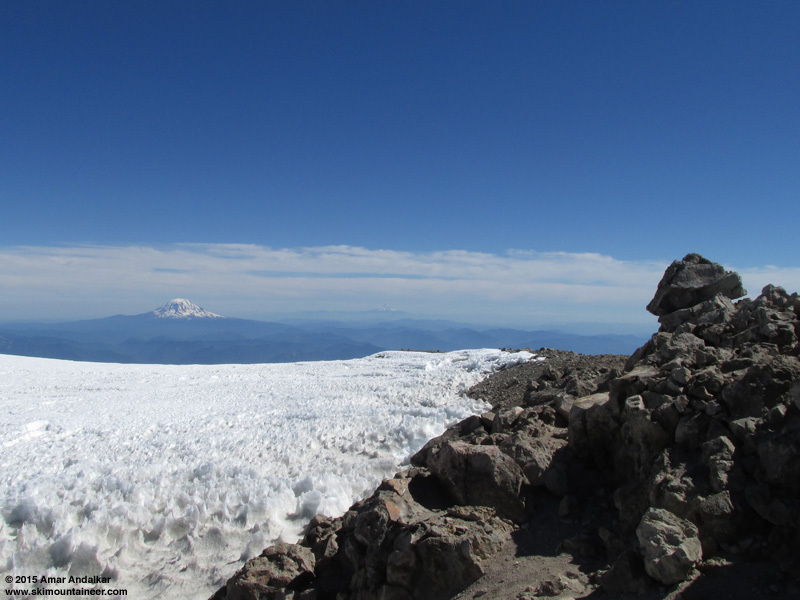 Temperature was about 35 �F, while a westerly breeze of 15-20 mph kept it quite chilly atop Columbia Crest. 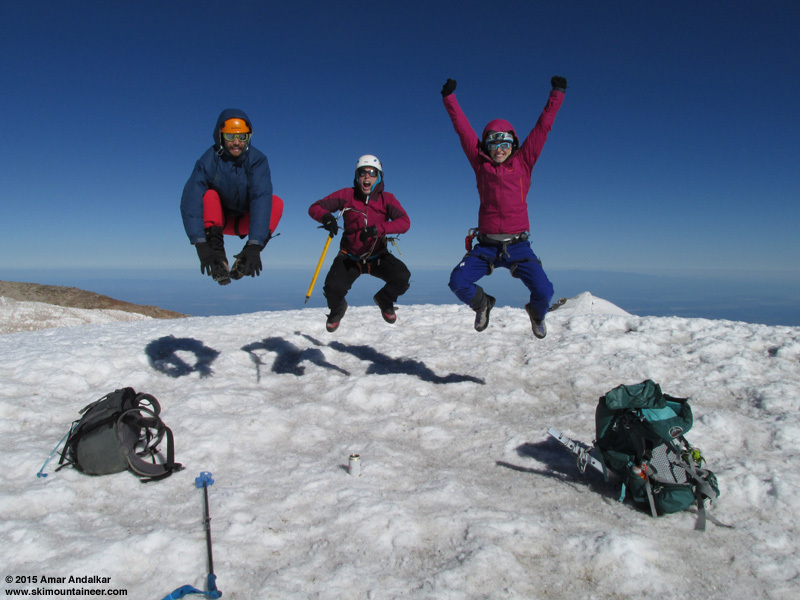 Kam, Dafna, and Meira, all airborne, with Rainier beer in foreground. I was a bit more subdued, with Liberty Cap (14112 ft) in the background. My friends soon headed back down the Emmons at 9am, and the overall numbers of people around the summit were quickly decreasing too as they all headed down before the glaciers oversoftened. But I had the whole day to hang out up there and explore the geological wonderland which is the summit region of the highest volcano in the contiguous United States, a rare luxury indeed. I started off with northern sections of the east crater rim on my way back to camp, then spent a couple hours resting and melting plenty of water for several more hours of high altitude hiking. My goals for the day were to explore the west crater rim which I had never been to, but which was likely to have the best view of the evening fireworks shows down in Puget Sound, and to revisit 14158 ft Point Success and maybe also 14112 ft Liberty Cap, the 2 other 14000+ ft summits of Mount Rainier. I had last visited those 2 summits almost exactly 6 years earlier on one of the biggest ski days of my life (see TR: July 1-2, 2009, Mt Rainier, 3 Summits via Emmons, the photos all work if you click them), when I had completed full ski ascents and descents of all 3 summits in a single day, perhaps the first time that had ever been done (the ski ascents are the key difference, as several others have skied down from all 3 summits in a single day). As I was getting ready to head out just after 11am, I was surprised to see a group of 5 in 2 rope teams arrive in the crater, and head towards the flat low point at its northeast end. I chatted with them a bit and found out they were led by a pair of IMG guides, had climbed via Fuhrer Finger (in very gnarly late-season condition), camped atop Wapowety Cleaver last night near 13000 ft, and were planning to camp in the crater overnight. I was pleasantly surprised to have some company up there, although I had been mentally prepared to be completely alone for another night after seeing no one else up there the night before. Having another group up there, especially guides with radios, would also provide an important additional safety factor in case of any unforeseen issues. 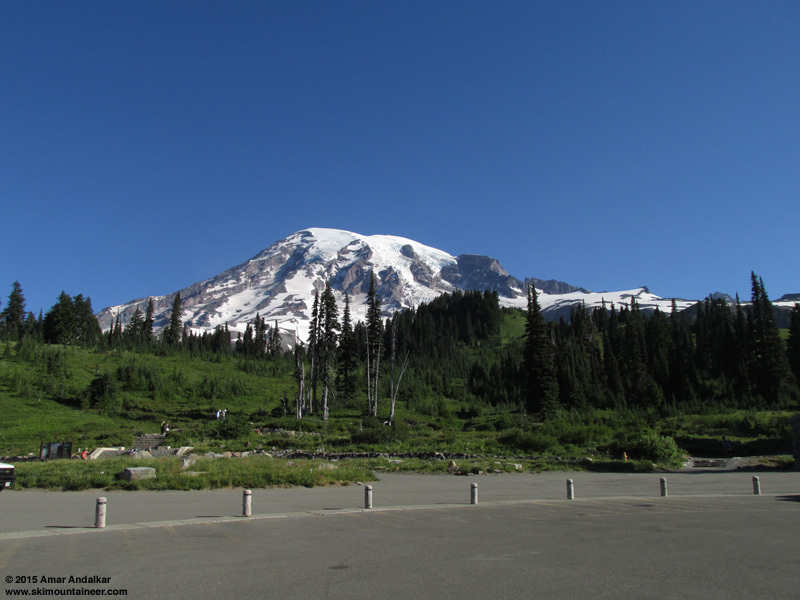 Upper image: Seven-shot panorama spanning about 250� of the west crater of Mount Rainier from the 14400+ ft middle rim between the craters, with 12276 ft Mount Adams in the distance at left, 14158 ft Point Success at left center, the 14370 ft west rim of the west crater at center, 14112 ft Liberty Cap at right center, and the true summit of 14411 ft Columbia Crest at right. Meanwhile I could see the group of 5 heading up towards the summit, but I didn't want to wait around for them in the cold breeze, we could always chat later back at camp. Or so I thought. I headed down into the west crater and straight across to the west rim of the west crater, which I had never visited even once before, even though I had skied down into the west crater several times previously while heading for Point Success and ski descents of the Kautz Glacier. I can't believe I'd never come over here before, because the west crater rim is awesome! The view looking back across at Columbia Crest is alone worth the trip, a very unusual perspective on the summit which is so familiar from other angles. 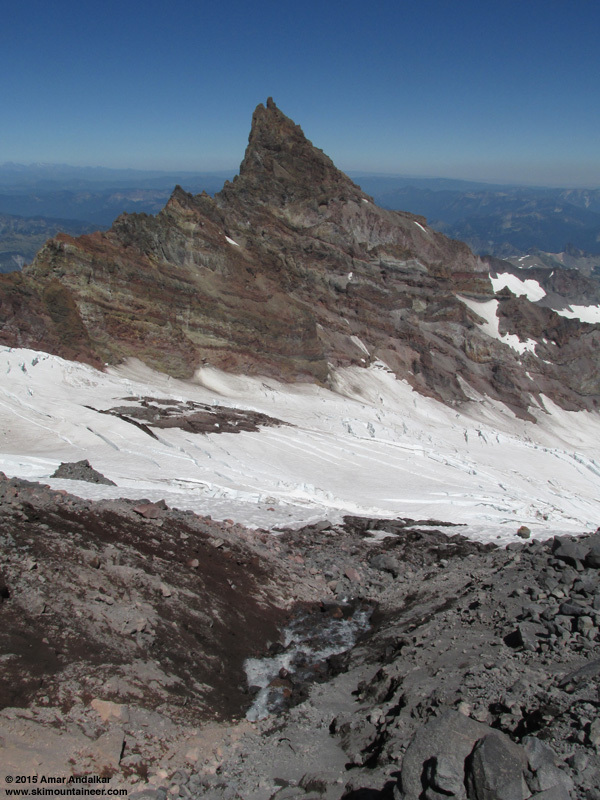 Part of the group of 5 approaching Columbia Crest, as seen from the west crater rim. It's too bad that only climbers coming up the Tahoma Glacier routes (or those camping and exploring the summit region) ever get to see this view of Columbia Crest. I really like it a lot, much more than the normal view from the east crater where the true summit is barely visible at all above the rest of the rim. A craggy outcrop of lava marks the roughly 14370 ft high point of the west crater rim, with the uppermost block a perched boulder of lava with light clearly visible underneath it from several angles. With an estimated mass of about 1-2 tons (volume roughly 15-20 cubic ft, rock is about 170 lbs per cubic ft), this boulder was clearly not placed there by anyone and must have been launched by explosive volcanic forces in the last eruption from the west crater, to land atop its current pedestal. As expected, the west crater rim did have a much better view of the lowland cities than the true summit, and was much less windy too. 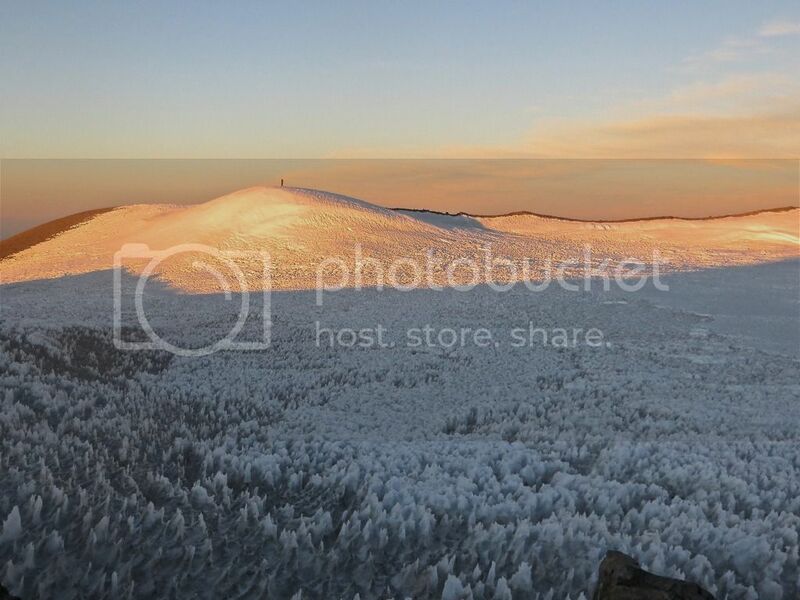 The cool breeze atop the rim could be avoided entirely by dropping only a few feet below the high point on the crater rim, so this would definitely be an ideal spot to watch the sunset and the fireworks shows without getting too cold for comfort. After lunch and a long rest, I headed south along the rim towards Point Success. The 300 ft descent from the west crater down to the 14020 ft saddle was much harder than expected, with deep unpredictable postholing (waist deep in places) on most snow surfaces, now well oversoftened at 2pm and thoroughly rotten underneath, and it was best to stay on bare ground as much as possible. Once on the saddle there were traces of an old bootpack heading towards Point Success, which made travel much easier. 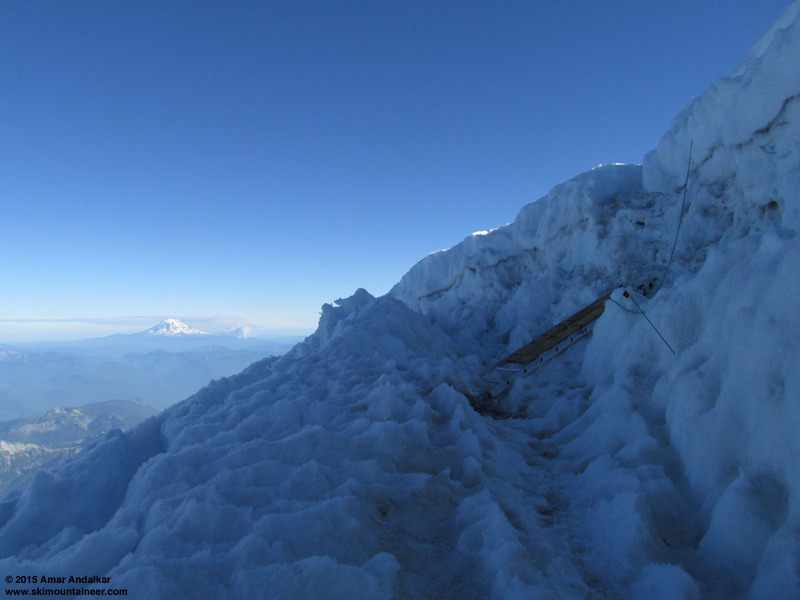 But arriving near the top of Point Success, there was a very nasty surprise: a large crevasse has cleft the snow and ice atop the Point along its entire length, with no easy way up or around from this direction. It really looked like a a completely different place than when I had last been there in July 2009 or earlier in May 2008, when there was no hint of any crevasse, and only a smooth ridge of snow heading to its summit, so gentle that I could ski up it easily without skins right to the top. 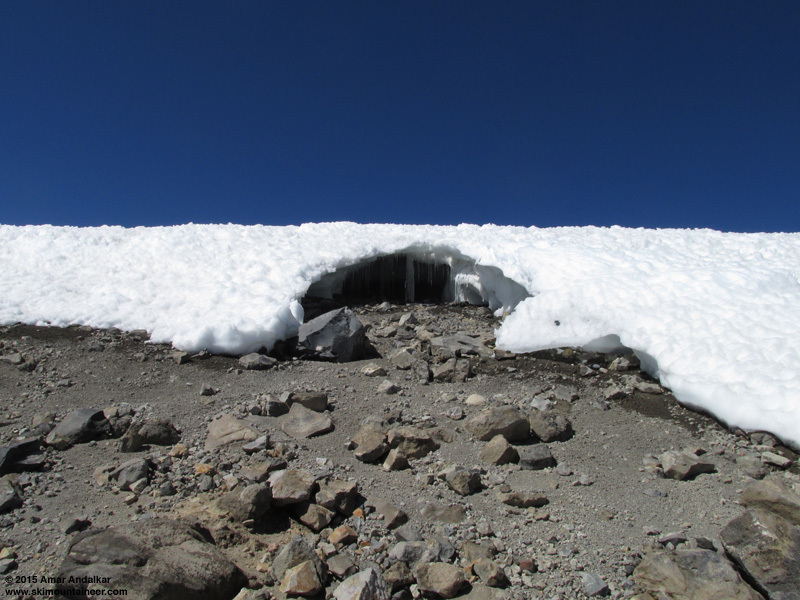 Now it was easy to get within about 8-10 vertical feet of the top, but climbing that last bit involved crossing the large crevasse on any of several uncertain snow bridges. 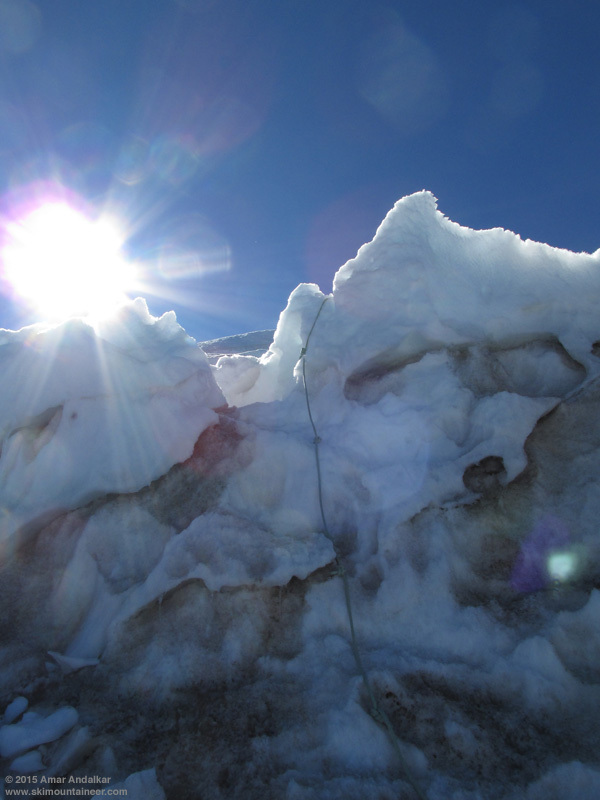 It would have been simple and safe to climb with a rope team, but being solo, it was completely not worth risking my life just to climb the last few feet of snow atop Point Success. Then it was time to head back up towards the summit dome. Climbing up via a slightly different route to stay on bare ground more, I found a couple of interesting steam cave entrances on the south side of the west crater. 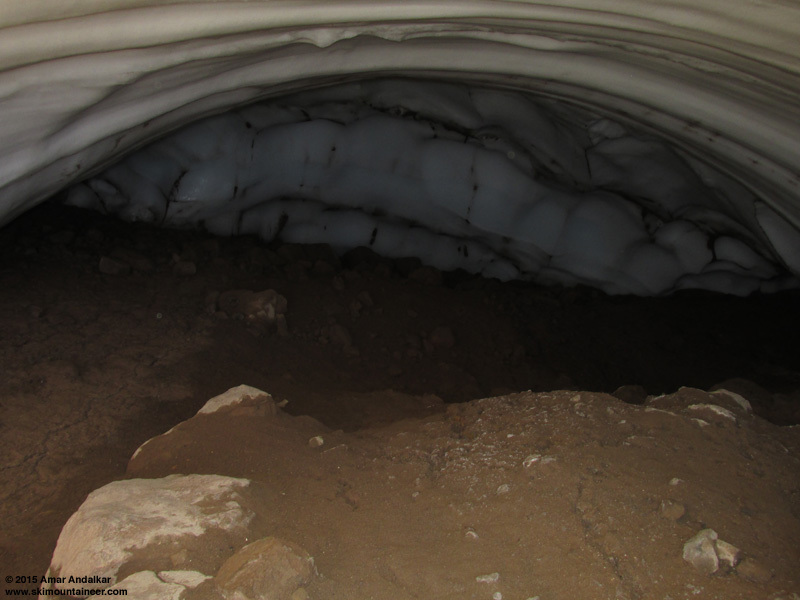 Unlike all other steam cave entrances in the summit craters which are along the inside of the rim, these faced outward (south) away from the rim here, which is completely buried by permanent snow and ice along the entire south side of the west crater. Then it was back along the west crater rim to the 14370 ft high point, and then continuing north along that rim. One interesting thing I noticed all day was that yesterday's huge fire plume on Mount Adams was not visible at all today, only a large burned looking area along its west flank. Not sure how the fire activity decreased so quickly overnight, perhaps it was fast intervention (unlikely in such a remote wilderness location), but more likely natural causes. 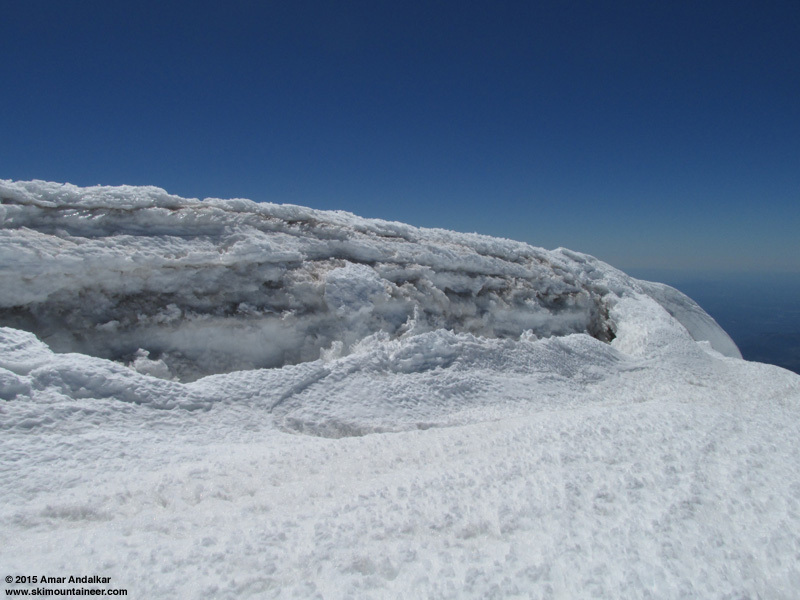 Mount Adams rising above the snowy floor and south rim of the west crater, with the 14370 ft high point on the west rim at right. No fire plume visible today. As I continued north along the west crater rim, something very interesting happened to the ground underfoot: it was completely damp with moisture along much of the crest of the rim, despite bright sunshine and very dry air. Evidence of steam from Rainier's hydrothermal system percolating out through the soil along those portions of the rim, the same process that helps carve out the steam caves which lined the inside of this entire section of crater rim. Being solo, I didn't feel safe venturing more than a few feet inside any of the steam cave entrances. Still have to explore those caves in greater depth at some time, although that will require several partners for safety. The same group that was exploring and re-mapping the caves last summer (see this Seattle Times article) is apparently planning to return later this summer, so maybe I should try to get in touch with them, or just camp up there at the same time as them. It was 4:30pm now, so I decided to forgo the long hike over to Liberty Cap (descending over 700 ft to the saddle, then gaining 500 ft to reach its top, and descending 500 and gaining 700 again on the way back). 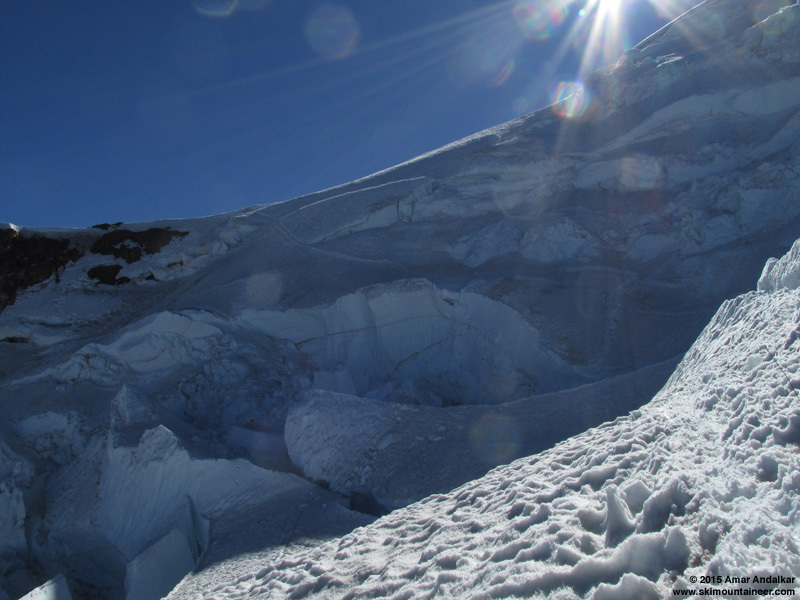 That would likely take 2 hours at this elevation, plus there were a couple of crevasses that needed to be crossed along the old bootpack which led from the saddle to its top, not very safe solo. Instead I decided to head back to camp for a nap until 7pm or so, then eat dinner and head for the summit again sometime after 8pm to watch the sunset and eventually the fireworks shows. But as I worked my way up from the west crater to the east crater's rim, I was in for a real shock: the group of five had vanished, with no evidence of the campsite they were about to start setting up when I had left almost 5 hours earlier. Obviously, they had changed plans and descended, and I would be all alone up on the summit for a second straight night. After arriving back at camp, I spent some time digging various improvements (seats, foot pits, etc) which I had been unable to dig out in the hard frozen snow of the previous evening or this morning, but which were now very easy to construct in the well-softened afternoon snow. Then I napped for a couple hours in the warm tent, ate dinner and melted enough water to last the night. 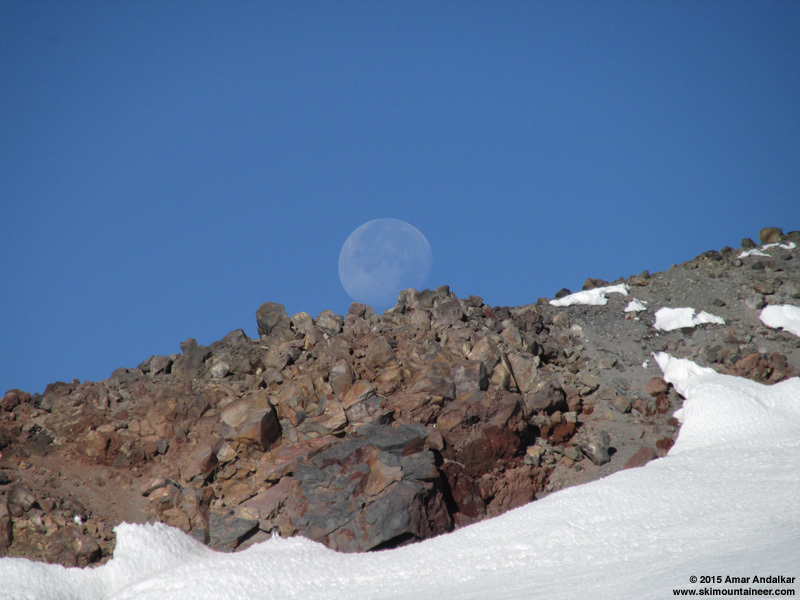 Around 7:30pm, I was surprised to see a solo climber arrive in the crater, and continue on to Columbia Crest. I last saw him atop there around 8pm, but I never saw him descend. I set off for the summit myself at 8:30pm, but would see no sign of him up there or at all. The east crater had been entirely in shadow since just after 8pm, but it was still bright and sunny on the upper crater rim and at Columbia Crest. 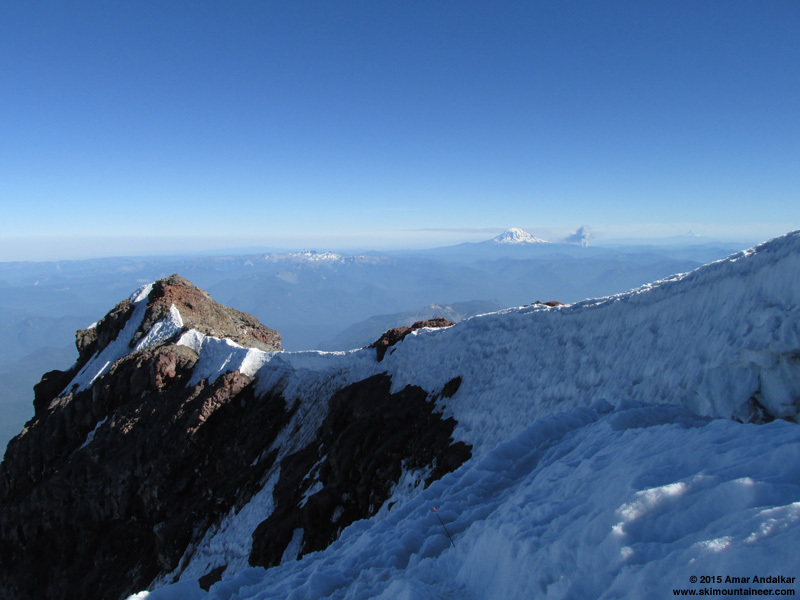 And the conical shadow of the Mountain was rising up towards the horizon in the distance beyond the east crater, an astonishing sight as always, now seen from an elevation and angle that I never had before on Rainier. I walked back and forth between Columbia Crest and the northwest side of the east crater several more times, trying to stay warm in the continuing cold westerly breeze and also trying to get the best possible sunset and shadow panoramas as the shadow grew higher and higher while the sun sank lower and lower. Right at 9pm, as I was about to head down from Columbia Crest and across the west crater towards the west crater rim, I noticed something very surprising over there: 2 people had suddenly appeared on the rim! I headed across, curious to find out where they had come from. Behind me as I crossed the west crater was a stunning sunset glow on Columbia Crest, along with the Mountain's shadow now extending far up into the sky, and I stopped to shoot panoramas several times. 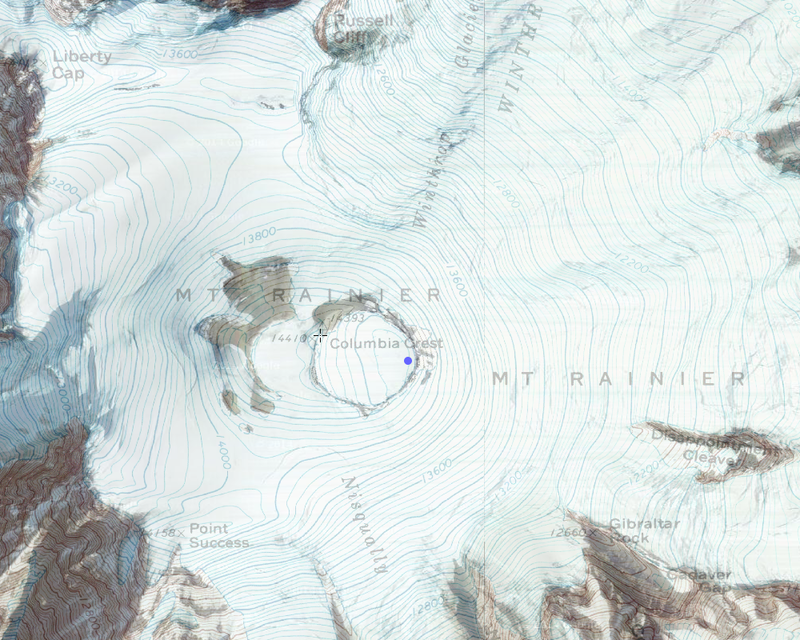 The two people I saw turned out to be a pair of climbers, Kevin and Keith, who had arrived at the west crater rim via Tahoma Glacier after an arduous climb which took over 13 hours from their camp at 9700 ft near St. Andrews Rock. 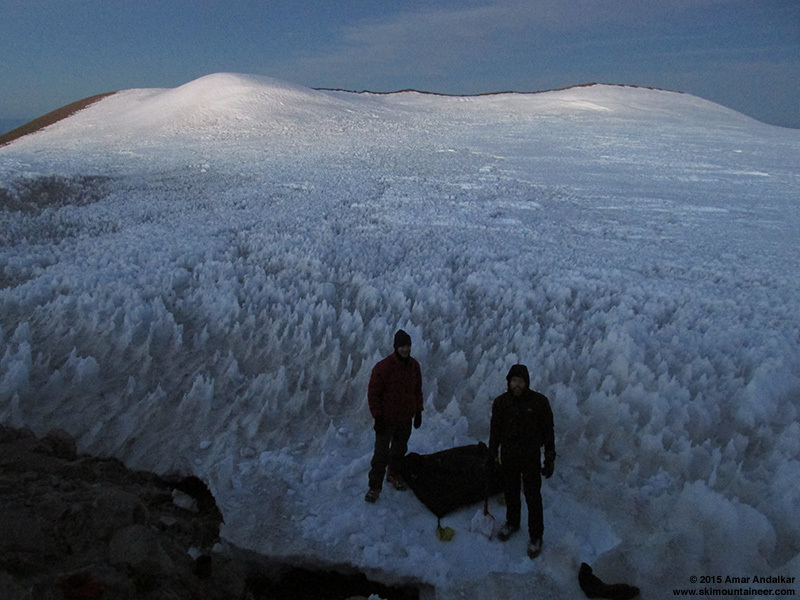 They were now quickly carving out a tent platform among the knee-high penitentes that studded the edge of the west crater, a difficult task in the quickly refreezing snow. I chatted with them at length as they worked to establish their home for the night in the fading light. The three of us watched the stunning sunset and afterglow, with Venus and Jupiter still in close conjunction in the western sky. 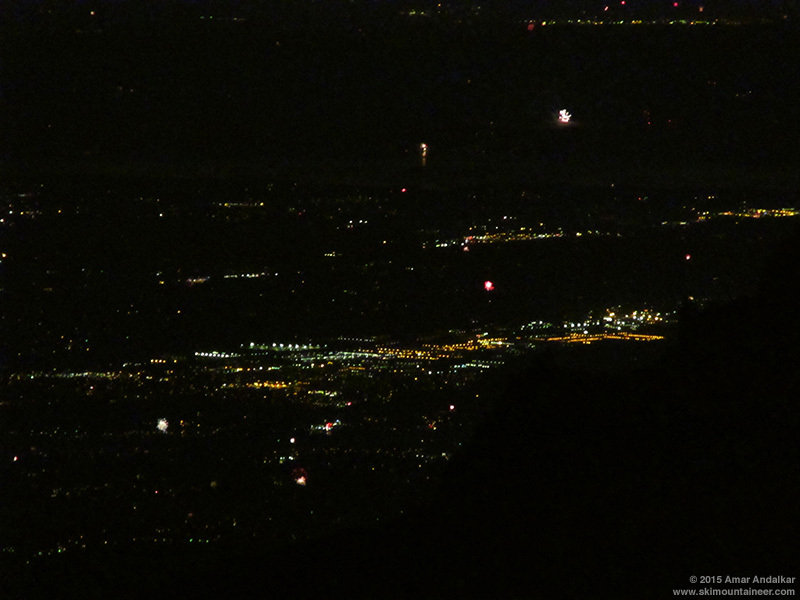 Then after 10pm we saw at least a half-dozen separate fireworks shows in the major cities on both sides of Puget Sound, with hundreds of other scattered bursts of light throughout the lowlands. With only a point-and-shoot camera and a miniature Ultrapod tripod, shooting photos of the fireworks was very difficult. But the nice 448 mm zoom on my Canon SX160 IS at least brought the fireworks into range, even if most of the shots ended up blurred due to the slow CCD sensor, flimsy tripod, and the breeze atop the crater rim. Then it was back to my tent by 11:20pm, for what I hoped would be a solid night of sleep. It was not to be, although it was much more pleasant than the previous night, I still suffered from insomnia until at least 3-4am. Oh, well, so it was. July 5th: Having missed the sunrise by hours the day before, I was considering waking up early enough to catch the dawn this day. But given the lack of sleep overnight, that was simply not possible, and I slept in until after 7am once again. I eventually realized that I needed to get up and over to the summit, or I would miss seeing the other friends that I knew were coming up the Emmons. I also had found out while registering on Friday that the park superintendent Randy King would be making a summit attempt up the Emmons guided by several climbing rangers whom I knew well, so I was hoping to see them up at the summit too. It was 8am before I once again headed towards the top. 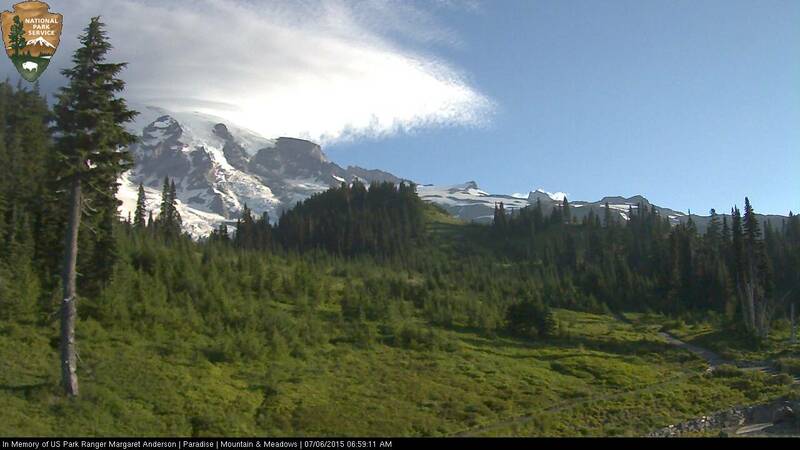 A lovely morning in the crater, looking back south towards my tent and Mount Adams. My timing was good though, and upon reaching the northwest part of the rim, I immediately saw 3 of my friends approaching the rim up the final portion of the Emmons-Winthrop route. 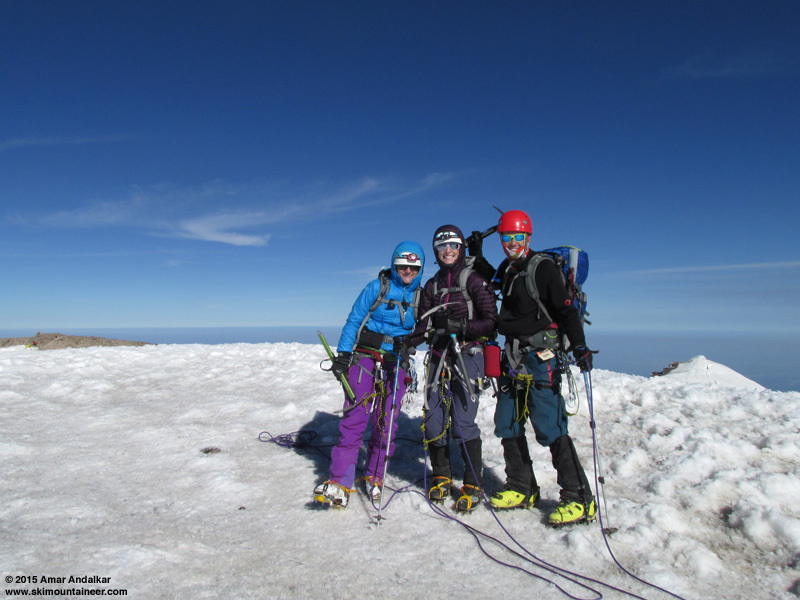 The other rope team from their group had already arrived at the summit earlier, and were resting on the inside of the crater rim, trying to stay out of the cold westerly wind. Sadly I found out from them that I had already missed the climbing rangers and park superintendent, oh well, I needed the extra sleep. Russell greeting me at the rim, while other Russell and Paul rest. Theresa, Casey, and Bruce atop Columbia Crest. It was definitely colder than the day before, with an air temperature of 32.5 �F and winds 20-28 mph over a few minutes of measurement atop the Crest. 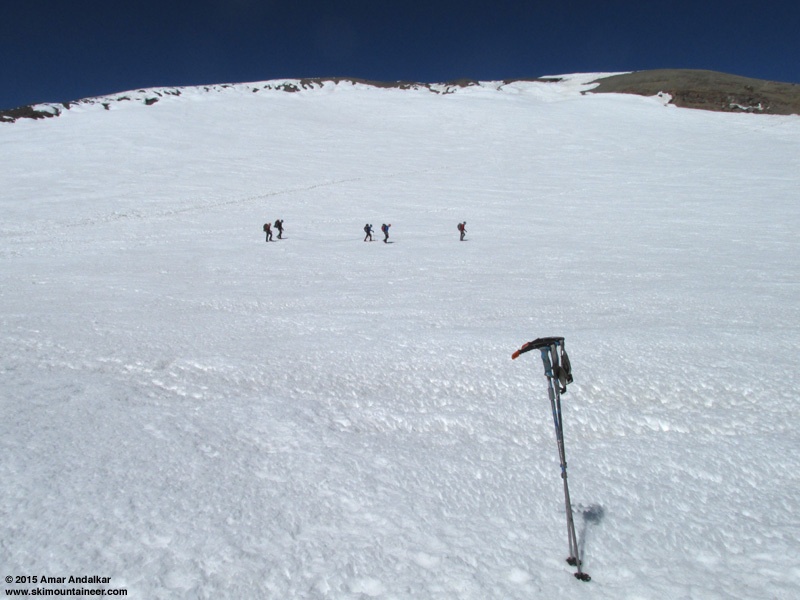 I chatted for a bit with the group, then headed down to Register Rock to eat breakfast totally out of the wind, and then came back up to the summit, where they were melting water from a large snowbank on the inside of the crater rim in preparation for their descent. Soon it was time for me to break camp and get ready for my own descent, so I headed back down to my camp around 9:45am. I also noticed that the two climbers in the west crater had started to break down their camp, and would be descending soon. Took a relaxed pace breaking camp and melting enough water to last the rest of the day, since I wanted to be sure to be a few hours behind all the guided parties which were descending the route, in order to not get stuck at the various ladders and fixed lines. So it was 11:45am before I was packed up and ready to head down. I quickly caught up to a pair of GoPro-topped climbers who had come up the Kautz earlier that morning, right at the sketchy crossing over the bergschrund at 13900 ft which still had no fixed line or ladder in place. The tail climber punched through one leg while crossing, but was able to get out with no further assistance. I would have to make sure to step very carefully the entire way down to the top of the DC to avoid a similar incident. 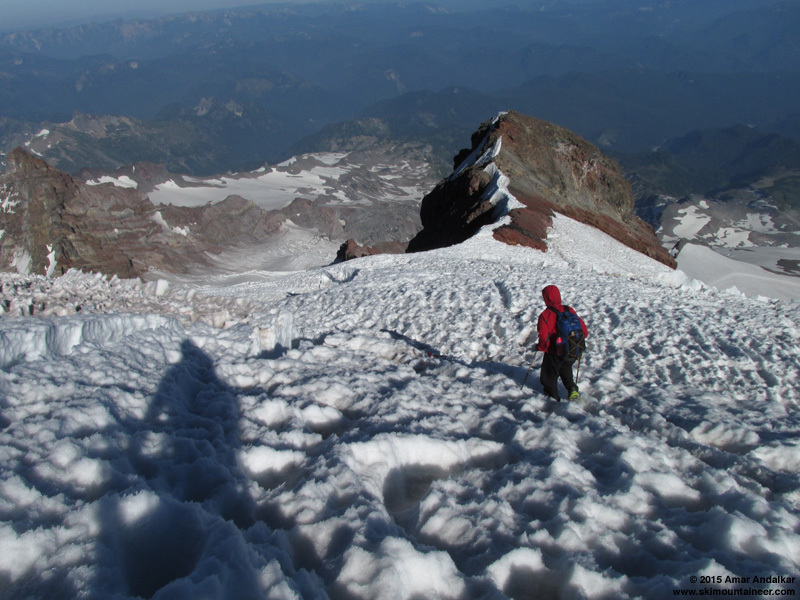 They let me pass on the easier terrain after that, and I soon caught up to the Tahoma Glacier team at the uppermost ladder near 13200 ft. Unfortunately that ladder had suddenly shifted as their lead climber crossed just seconds earlier, and the second climber was soon working to reset the picket which anchored the upper end. 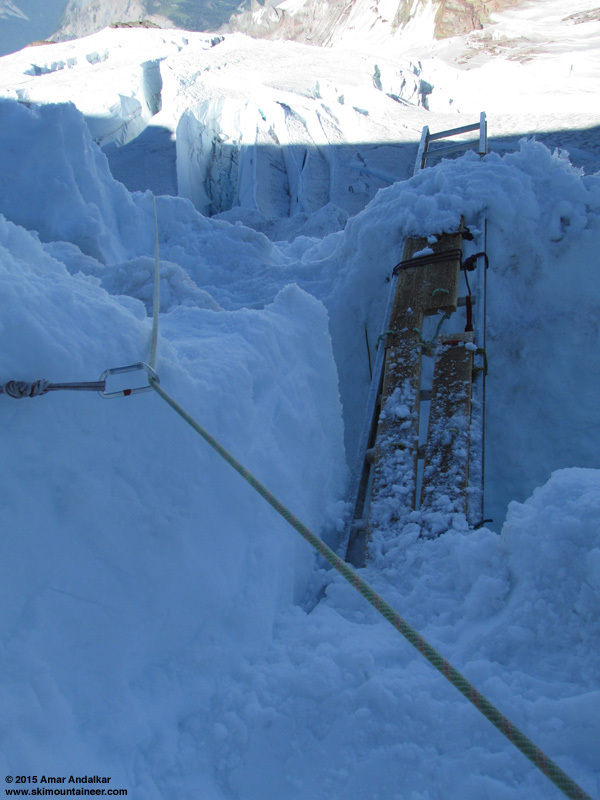 Luckily, this was the ladder with snow right under it and not a huge open crevasse, but it was still a cramped and awkward spot. 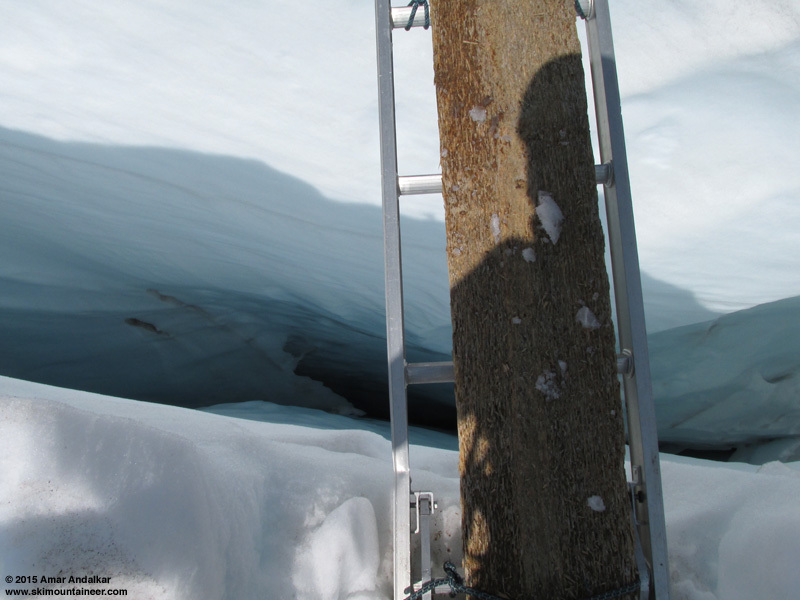 About 15 minutes of hard work, much of it hammering the picket into the hard glacial firn with an ice tool, was needed to reset the ladder securely. Not much I could do to help either, but I was glad that I hadn't caught up to them before this spot, otherwise the ladder might have shifted as I crossed it. While they were resetting the ladder, they asked me how comfortable I felt with the descent so far, and very kindly offered to let me rope up with them if I wanted to. I felt very comfortable soloing thus far, so I declined their generous offer, although I said I might wish to join them later if some section felt too sketchy. They let me pass on the traverse immediately afterward, and I continued down to the crux. Given the fixed line to clip into, this section felt more than safe enough to continue solo. 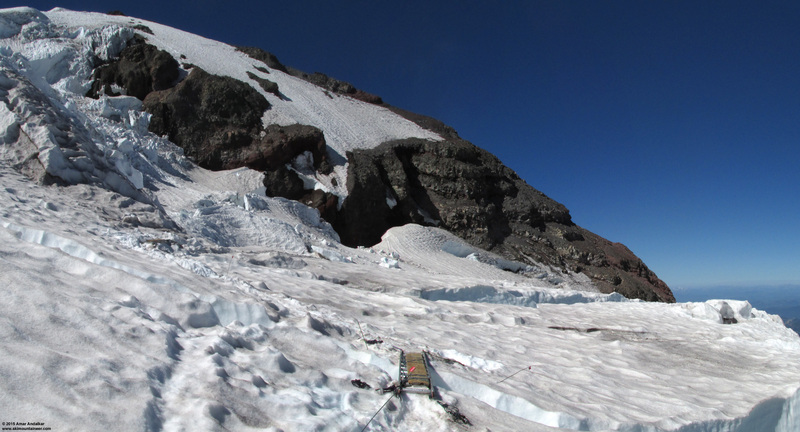 The ladder was very firmly anchored, so crossing it was easy, and the rest of the route after that was a cruise down to the top of the Cleaver, where I could look down and see my skis waiting for me at the Camp Muir ranger hut over 2000 ft below (well, almost see them). Zoomed view of Camp Muir looking down from the top of Disappointment Cleaver at 12300 ft. Snow conditions remained good on the descent of the Cleaver despite it being 1pm on a very warm day, mushy for sure but not dangerously so at all. On reaching the end of the snow at 11700 ft, I decided to take my crampons off for the descent, even though I had left them on for the ascent on Friday. 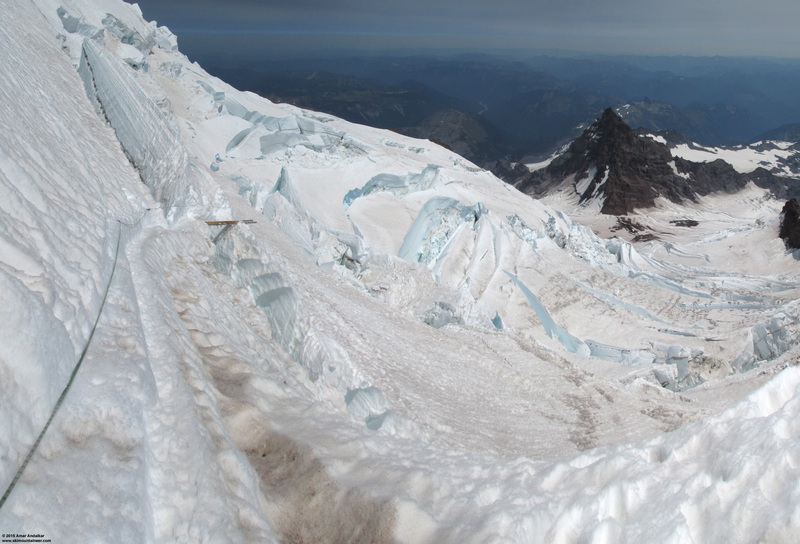 This worked out well, and the crampons went back on at the bottom of the Cleaver for the traverse across the Ingraham Glacier and down to the dirt above Cathedral Gap. After crossing the last 2 ladders at 11400 ft, I was relieved to be home free from the dangers of the upper mountain, and decided to take a look down into the deep crevasse after crossing it. Easily well over 100 ft deep, disappearing into blackness. 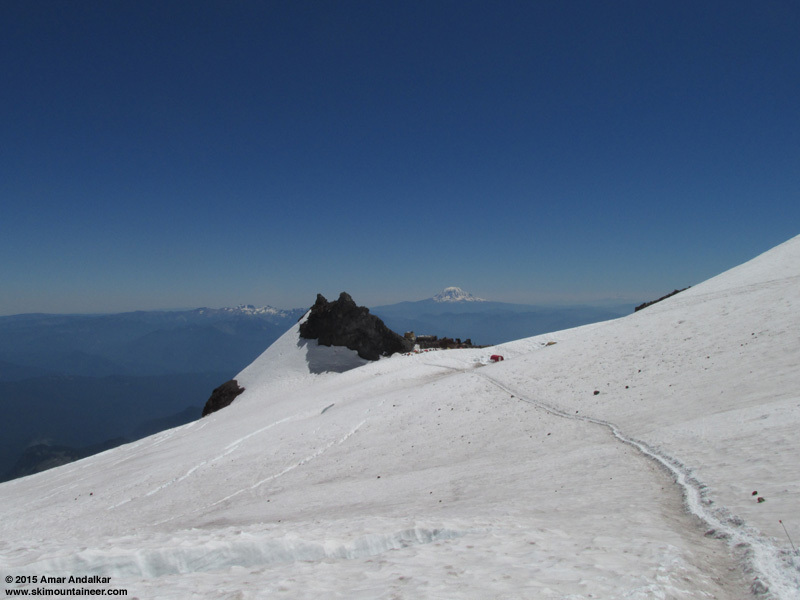 I was back to Camp Muir by 2:40pm, less than 3 hours after leaving the summit crater, and just over 48 hours after departing from here for the summit on Friday. Very glad to have such a quick and easy descent with no delays being stuck behind guided groups and only the minor necessary delay for the ladder reset. 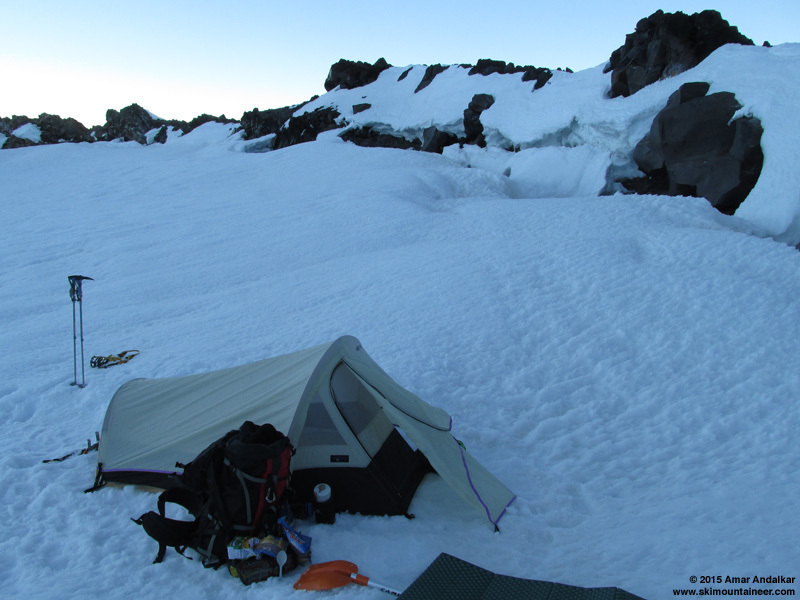 I chatted with John the climbing ranger, who assured me my skis were still where I had stashed them, and he said he'd seen my tent in the crater when they had patrolled up to the summit the day before. I didn't need any rest or to melt more water, since I still had plenty after the quick descent, so I grabbed my skis and headed to the edge of the Snowfield to finally get some turns. I had figured that around 3pm would be the ideal time to ski the moderately suncupped snow, trying to get the maximum possible degree of softening to smooth out the bumps. Snowpack measurement stake near 9700 ft on the Muir Snowfield, to measure the summertime ablation. Skied down around 3:15pm, the snow was nicely softened corn, which made the moderate bumps enjoyable, although less so with a still-heavy overnight pack. There was a thin layer of windblown ash atop the snow as expected, but not enough to make the skiing slow or unpredictable, and certainly not enough to get a stone grind. Would have actually been very fun skiing with a day pack. As usual in summer, it was very important to stay far away from the stampede path and on the smoother untrampled snow farther west. The skiing is still definitely worthwhile even if not super great, although I doubt many will be skiing this summer given almost everyone's defeatist attitudes this year. The best ski conditions were from about 9000 ft down to 7500 ft, and I skied all the way down to Pebble Creek by 3:45pm, sidestepping through a narrow spot near 7400 ft which had melted significantly since I had skinned up on Friday. One way to tell for sure if the skiing was actually good is if you don't want the run to end (if you can't wait for it to be over, then it's probably bad skiing). I was definitely sad to see the end of the snow approaching, wishing that I could ski some more, so it really was good skiing by that standard. Took a nice break beside the creek there, as I wasn't eager to put the heavy pack back on at all, still likely to be over 60 lbs with skis and boots. 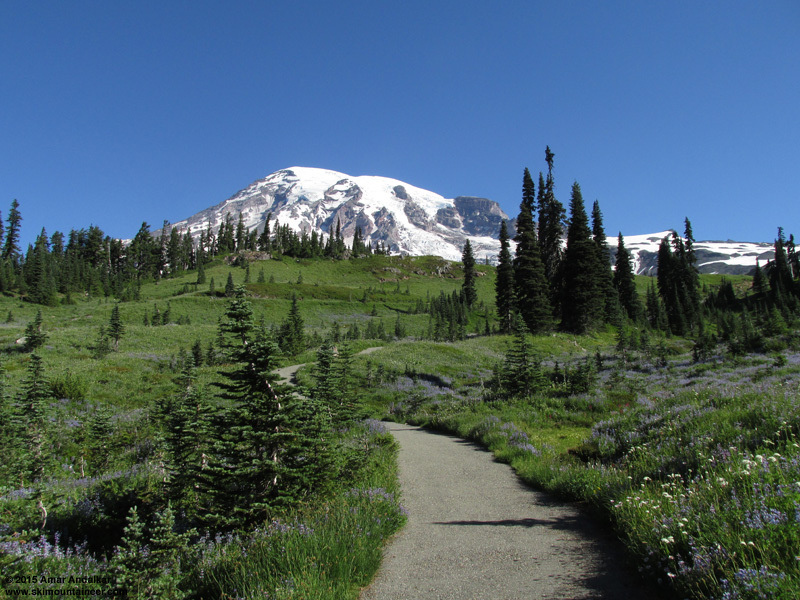 Finally headed down a bit after 4pm, and enjoyed a nice hike through the wildflowers once again, still completely bug-free too unlike many other areas in the park and throughout the Cascades, very nice to not have to deal with that annoyance. Back down to the car in about 70 minutes, relieved to ditch the heavy load and thrilled to have had a completely successful trip. An amazing experience camping up there for a couple nights, I'll definitely go back and do it again in similarly nice stable summertime weather. My only regret this time was not being able to share the whole experience with any partners. SYNOPSIS...HIGH PRESSURE ALOFT WILL REMAIN OVER THE PACIFIC NORTHWEST INTO AT LEAST EARLY NEXT WEEK FOR CONTINUED SUNNY AND UNSEASONABLY WARM WEATHER. FRIDAY...SUNNY. FREEZING LEVEL NEAR 16000 FEET. FRIDAY NIGHT...MOSTLY CLEAR. FREEZING LEVEL NEAR 16000 FEET. INDEPENDENCE DAY...SUNNY. FREEZING LEVEL NEAR 15500 FEET. SATURDAY NIGHT...MOSTLY CLEAR. FREEZING LEVEL NEAR 15500 FEET. SUNDAY...SUNNY. FREEZING LEVEL NEAR 14500 FEET. SUNDAY NIGHT...CLEAR. FREEZING LEVEL NEAR 14500 FEET. MONDAY NIGHT...CLEAR. FREEZING LEVEL NEAR 15000 FEET. TUESDAY...SUNNY. FREEZING LEVEL NEAR 14500 FEET. TUESDAY NIGHT...CLEAR. FREEZING LEVEL NEAR 14500 FEET. WEDNESDAY...SUNNY. FREEZING LEVEL NEAR 13500 FEET. WEDNESDAY NIGHT...CLEAR. FREEZING LEVEL NEAR 13500 FEET. THURSDAY...SUNNY. FREEZING LEVEL NEAR 14000 FEET. SYNOPSIS...UNSEASONABLY WARM WEATHER WILL CONTINUE THROUGH THE MIDDLE OF THIS WEEK. COOLER WEATHER WILL ARRIVE LATE THIS WEEK AS AN UPPER TROUGH NEARS THE AREA AND ONSHORE FLOW INCREASES. MONDAY...SUNNY. FREEZING LEVEL NEAR 13500 FEET. MONDAY NIGHT...CLEAR. FREEZING LEVEL NEAR 13500 FEET. TUESDAY...SUNNY. FREEZING LEVEL NEAR 13500 FEET. WEDNESDAY...SUNNY. FREEZING LEVEL NEAR 14000 FEET. WEDNESDAY NIGHT...CLEAR. FREEZING LEVEL NEAR 14500 FEET. THURSDAY...SUNNY. FREEZING LEVEL NEAR 14500 FEET. THURSDAY NIGHT...MOSTLY CLEAR. FREEZING LEVEL NEAR 14500 FEET. FRIDAY...SUNNY IN THE MORNING THEN BECOMING PARTLY SUNNY. FREEZING LEVEL NEAR 13000 FEET. FRIDAY NIGHT...MOSTLY CLOUDY IN THE EVENING THEN BECOMING PARTLY CLOUDY. FREEZING LEVEL NEAR 13000 FEET. SATURDAY...MOSTLY SUNNY. FREEZING LEVEL NEAR 12000 FEET. Nice report and great attitude! That was a legit TR. Nice work, great pics. Boy Amar, taking it to the next level! Sleeping on the top (or as Mike Rolf's would say the tippy tippy top) of the mountain on the 4th, what a coup. You must have had dozens of fireworks displays to take in.� I'm truly green with envy, and of course a spectacular report thanks. Thanks for the very detailed and inspirational report. Amar - great trip report.� It reads like poetry!� You should write a book! Thanks for the kind words, everyone. I'm still feeling some of the high from this trip now a week later. Nice work Amar. Reminds me of our summer climb a few years ago. I was shocked how fun it was, even without skis. Babying my knee for the past few months is driving me nuts...although it's nice to see others, like yourself, out there making the most of this incredible weather. Fantastic report as always. Great job.